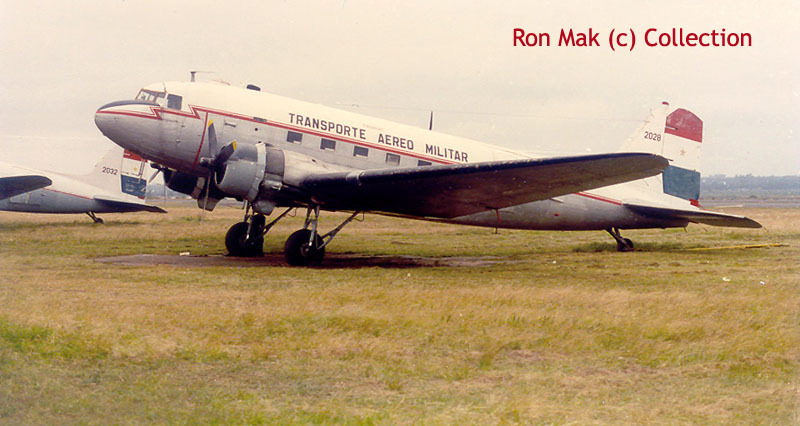 Well-known in Dutch propliner circles, Ron Mak's history with classic transports go back a long way. 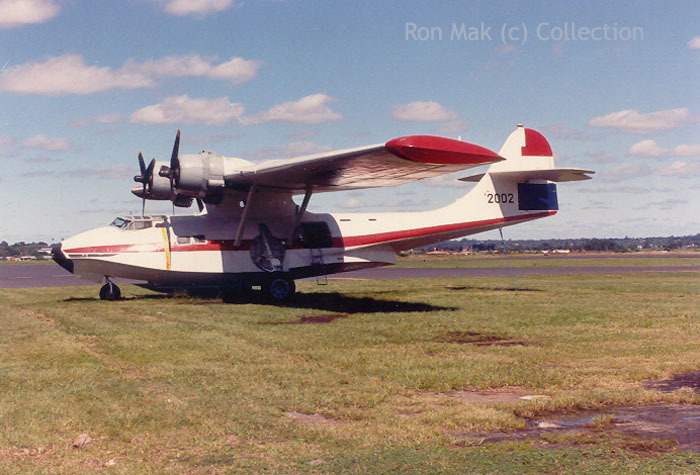 Ron Mak's interest in my website was sparked by Gene Richardson's account of FAP2002's (a Consolidated PBY Catalina) restoration. 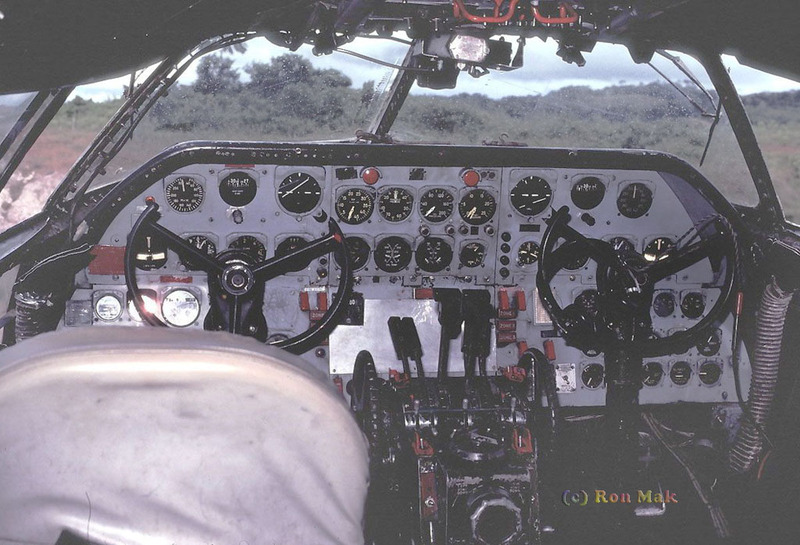 Ron wrote: "I was involved in preparing this PBY-5A Catalina, c/n 1737; during 1988 I travelled to S.America for the umpteenth time... But it was my first trip to Paraguay, and esspecially for this Cat. 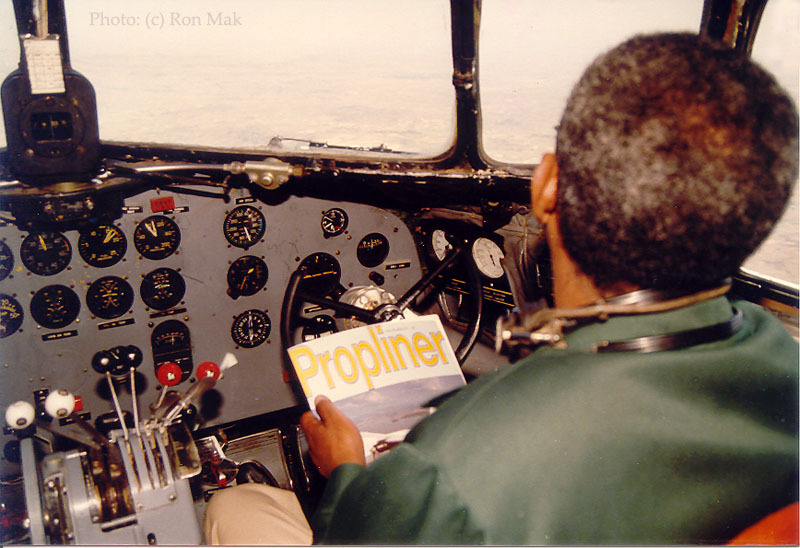 By coincidence a photo had been published in Propliner magazine and I wrote mr Tony Merton Jones and asked for details of the photographer, who appeared to be a Belgian and married to a Paraguayan; the photographer was a purser with SABENA and she worked with LAP in Brussels. I met them in Brussels and when I boarded the 707 at BRU I had obtained from them additional info on this Cat plus contact adresses to get to the Catalina. To cut a long story short: I had a hell of a time getting to the Cat but I got there in the end! Well, I had been involved in research of Catalina's for many years and I had at home the required manual! 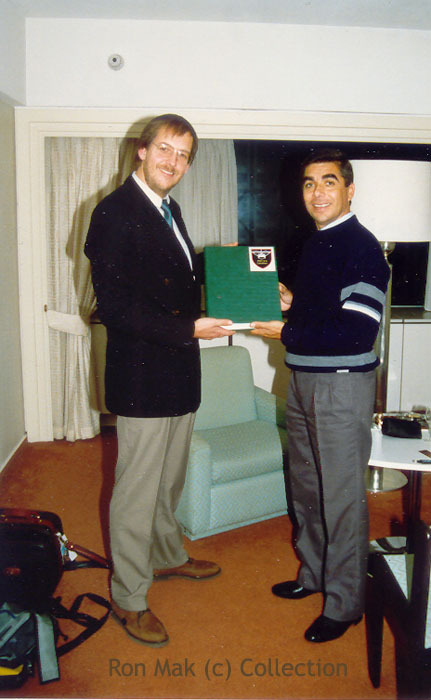 In January 1989 I brought the manual to Brussels and handed it over to Captan Cesar Rios who was flying with LAP; and he took it to the FAP base and shortly after this the Cat took to the air !! 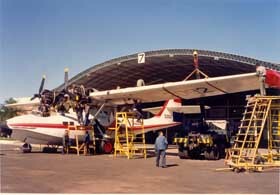 in maintenance at Asuncion 20Oct88. 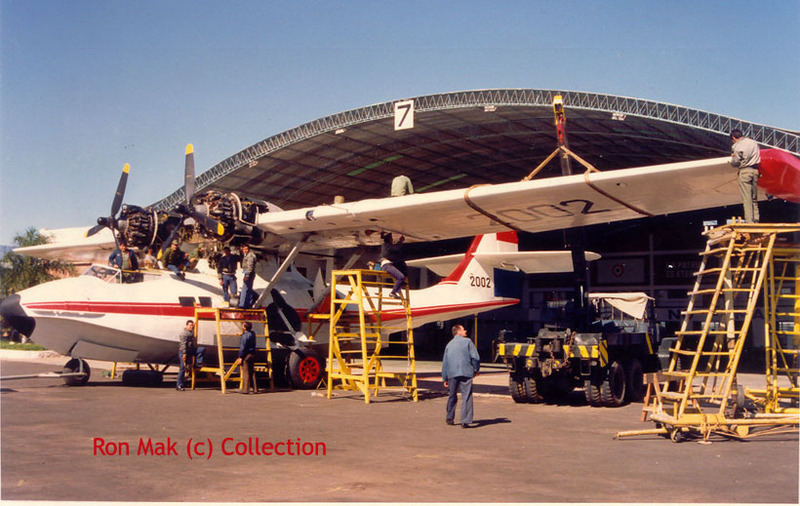 This PBY was located at Nau Camp at first, near the International airport of Asuncion, and later flown from Nau Camp to Asuncion Int'l." Interior of the Catalina FAP2002, at Asuncion in 1989. 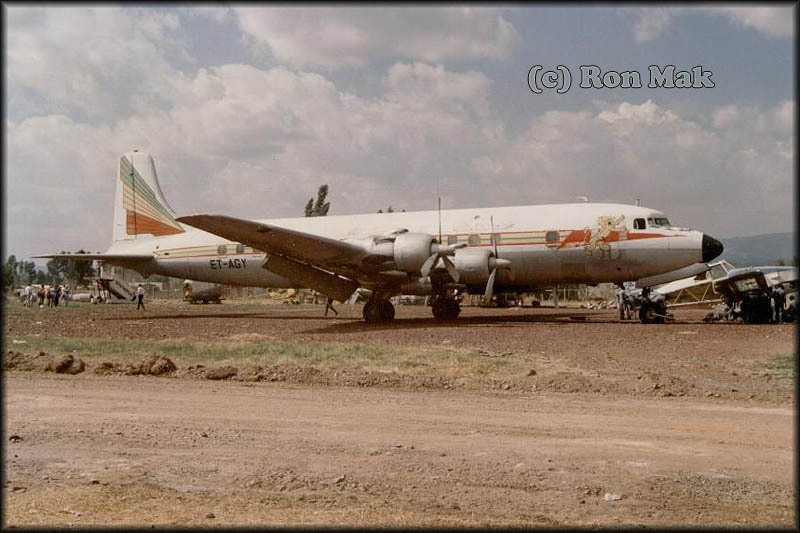 FAP2001, a single C-131D Convair (c/n 322) was operated by the FAP, seen here at Asuncion on 03Nov88; it was previously registered T-93 (renumbered in 1980) and ex/USAF 55-297 (saw active service in Germany, Europe with USAFE). 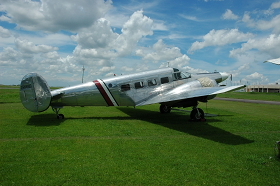 The Paraguayan government started operating social services within the country in the late 1940s, using Beech C-45s and Bonanzas. 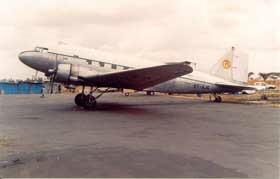 In Mar54 they were coordinated under Transporte Aéreo Militar, when the first C-47 was delivered. Three more were supplied in Jun55 and there were 5 in use by mid-1957. In the early 1960s2 more followed under MAP and another came from the USAF misson. Four more were supplied in 1964 and 5 in 1967, again under MAP. 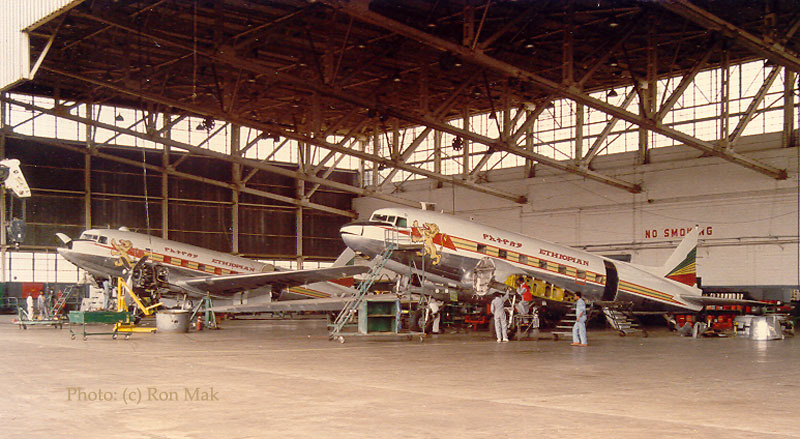 These were supplemented by a DC-6 and a Convair T-29. 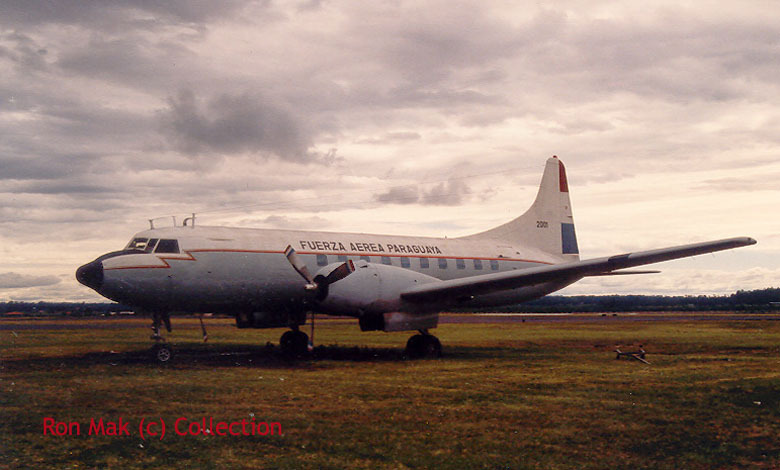 Initially the C-47s were numbered from T-21 to T-85 (odd numbers only), but in 1980 the Fuerza Aérea del Paraguaya adopted a new system from FAP2001 to FAP2023. 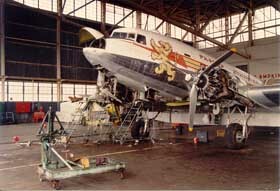 32 C-47s were known in 1982, and 4 in 1993. 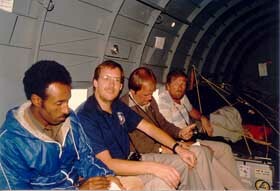 In April 2000 one was airworthy and 3 others in store. 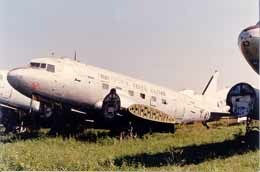 This Douglas C-47B crashed on 24Nov94, while on take off from Puerta la Victoria. 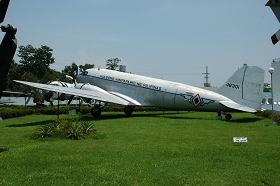 Source for the DC-3 information is DC-3, The First Seventy Years, published by Air-Britain in 2006. 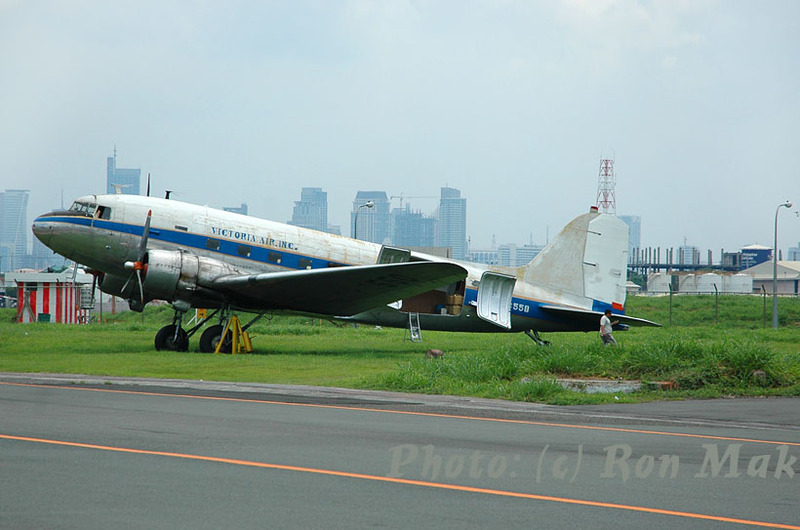 THE Victoria Air Inc. Douglas DC-3 was the last flying aircraft of its kind in the country, and when it crashed into an empty warehouse in Las Piñas last month it closed a page in Philippine aviation history. 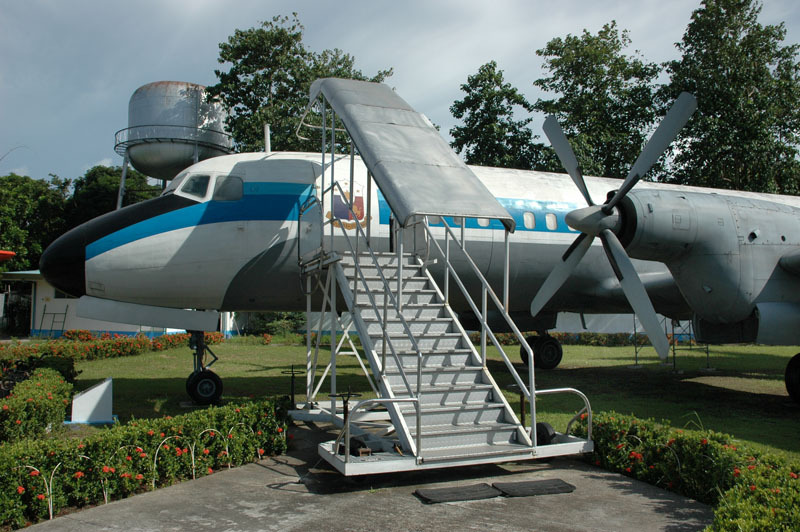 Ernest Sacro, spokesman of the Civil Aviation Authority of the Philippines, said the ill-fated plane, a World War II vintage aircraft that was originally a military C-47B, was the last after three other DC-3s were decommissioned sometime in 2000. 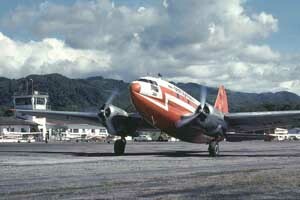 “That was the last DC 3 I know still flying in the country. 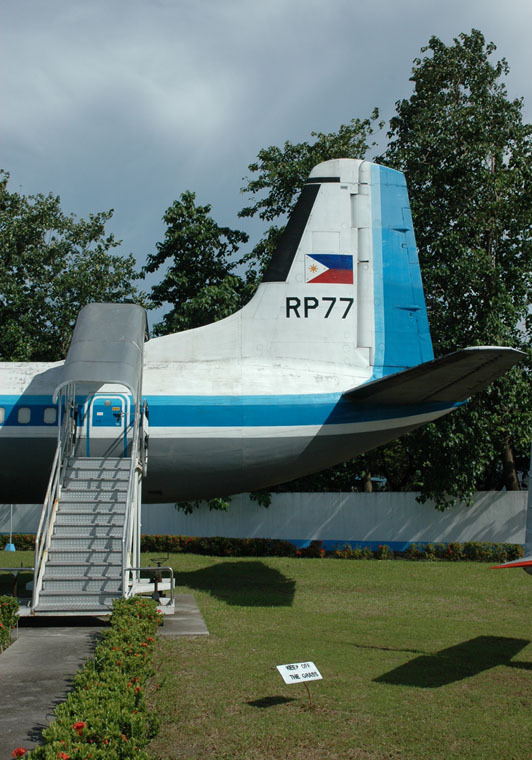 It was so old that its owner sold it for only P12 million,” Sacro said. Sacro said the crash not only killed the 4 people that were onboard, but also burned the P2.5 million cash that co-pilot Jaguar Juane was carrying as downpayment for the aircraft that had been sold to an unnamed Surigao del Sur businessman. 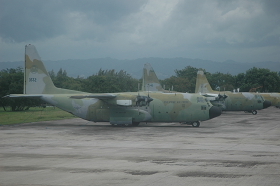 He said Juane was the younger brother of Gerry Juane, the plane’s real owner, although it was registered under Victoria Air Inc.
Sacro said human error was the likely cause of the crash as the pilot in command, Benjamin Rivera and Juane, were licensed to fly only smaller planes. 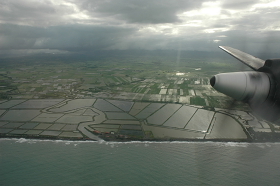 “The scrap from the plane’s wreckage would not be enough to pay for the damages it caused,” Sacro said. 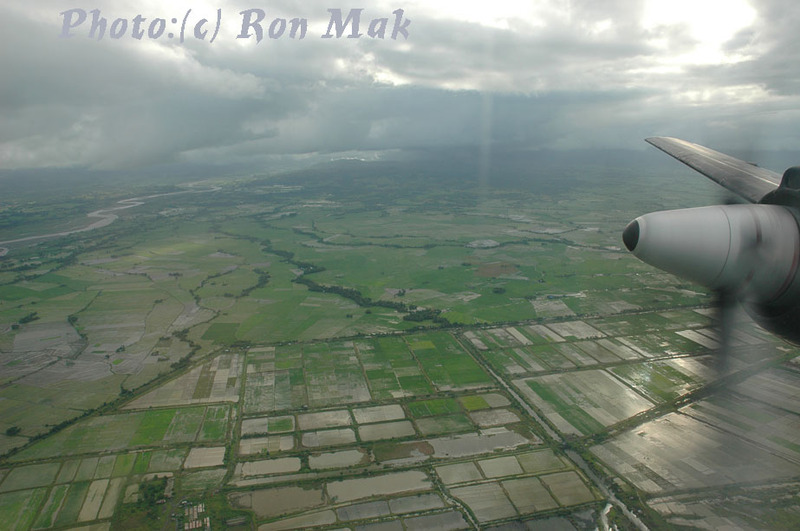 The plane departed Manila for Puerto Princesa City around noon, but the pilot turned the plane back minutes later asking for clearance for an emergency landing. 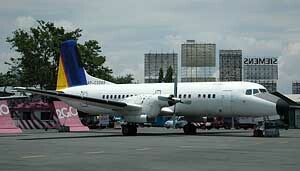 “It was not in a test flight as reported earlier. It was carrying six drums of aviation fuel and was supposed to fly to Surigao after it unloaded some cargoes in Brooke’s Point [Palawan],” he said. The flight manifest appeared to be falsified, indicating there were 7 people onboard but only 4 actually were. The plane appeared to wobble, its wings tipping up and down erratically, before it scraped the roof of several houses and hit the ground and ignited. “The plane’s left engine conked out but the pilot could have made a safe landing if he had pushed the left button to operate the engine’s fan,” Sacro said. 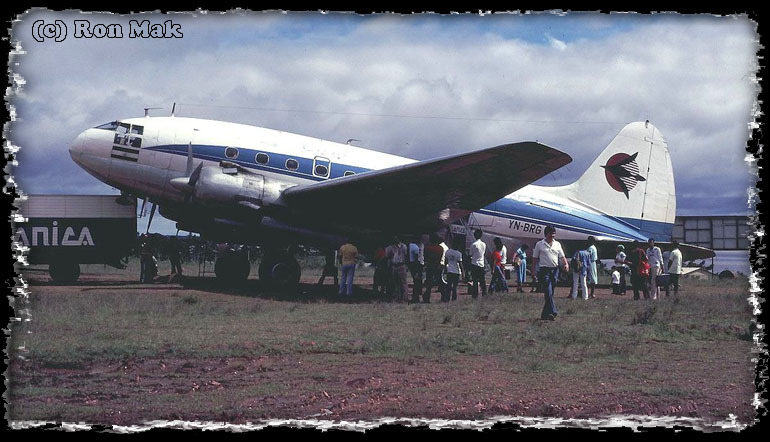 C/n 12557 in is above mentioned DC-3 book referred to as crashed on 24Nov94, but also noted as seen acting as an instructional airframe at Asuncion in 2003: probably a mix up with above FAP2028. 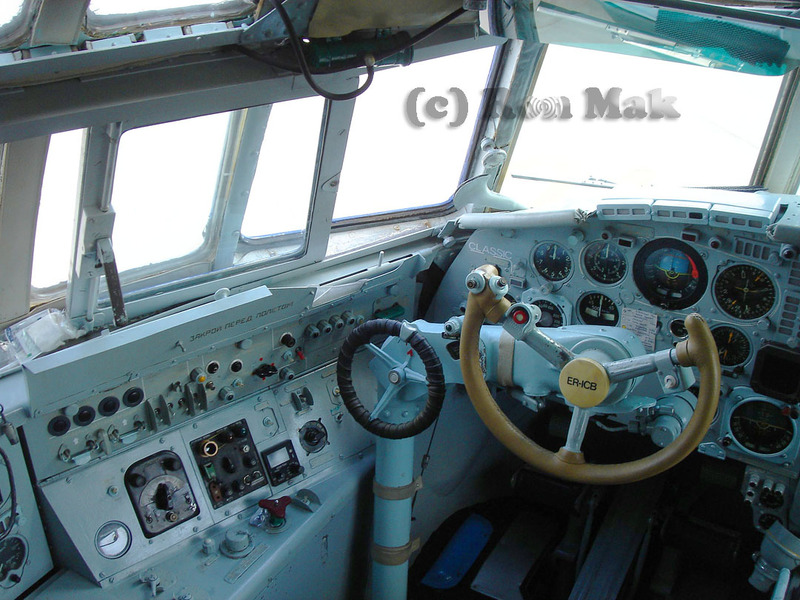 T-47, c/n 32926 (was to become FAP2013, but not taken up). This photo was taken by and is copyright to Michel Anciaux. 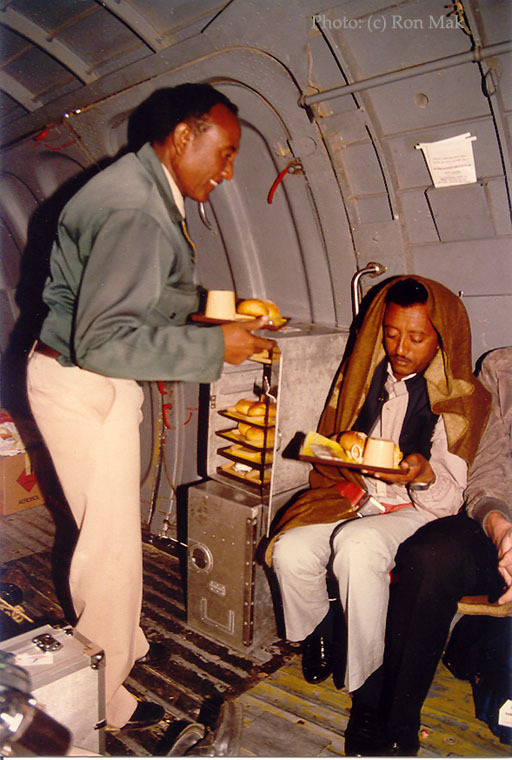 Ron Mak sent me these rather unique photos, recalling some adventurous travel in Ethiopia. 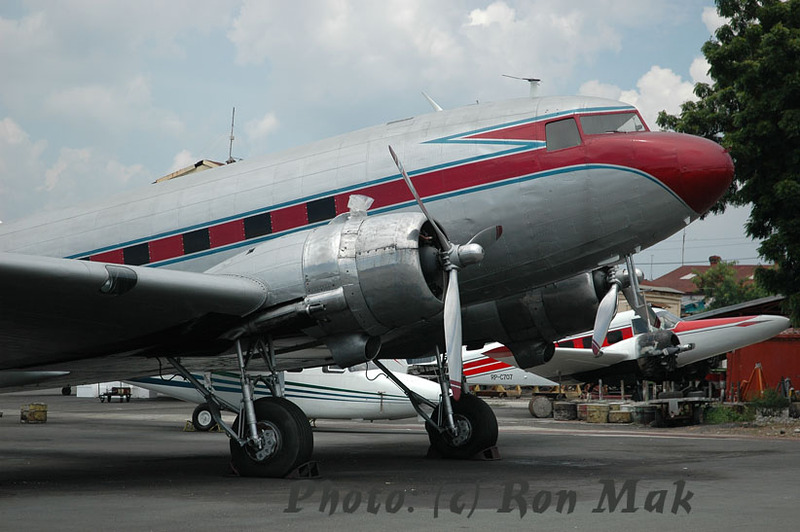 This is ET-AJG, Douglas DC-3C c/n 13576. 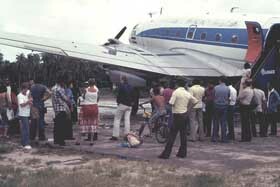 "The unidentified DC-3 at Zamboanga is one of Swiftair. RP-C860 and RP-C862 have been reported earlier as derelict there. 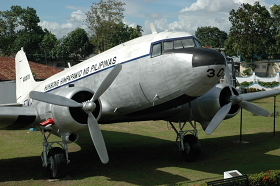 I just checked my slides and I have of both of them, but although minor differences in paint/config existed in their earlier life, the DC-3 pictured by Ron Mak has seen too many typhoons to confirm one way or another..."
This DC3 at Zamboanga City is RP-C862, not 860, although the owner claims it is 860! I checked the remaining plates inside: it is definitely RP-C862. The start of an unusual flight !! 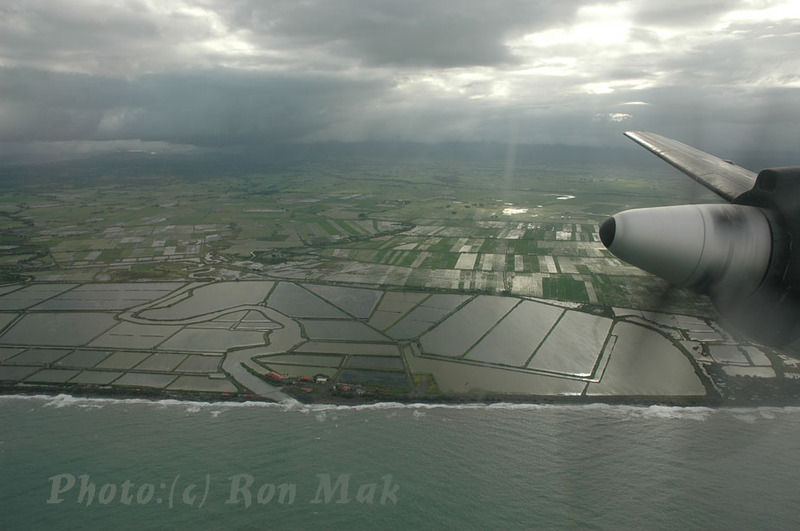 In August 2007 Ron Mak returned from the Philippines (see: Wikipedia) and kindly provided some photographic souvenirs of the present propliner scene in the Philippines. 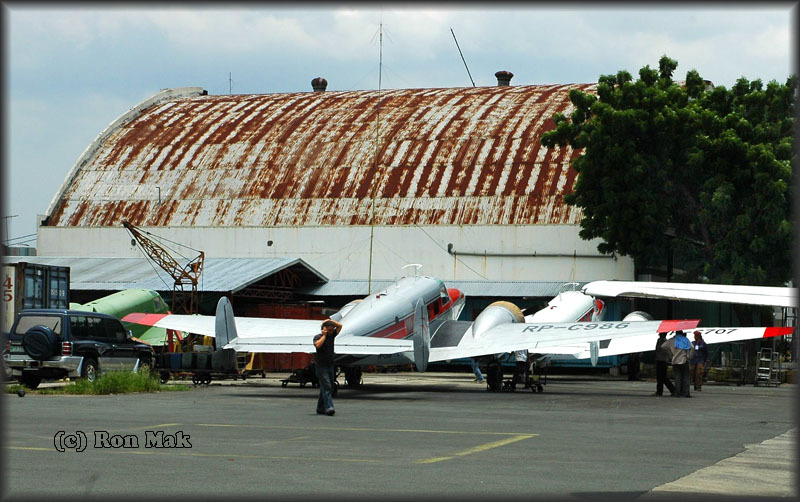 To add to the report Ron also included some 2006 photos; this is not meant to be a complete report of the scene at Manilla or the Villamor Museum, as obviously aircraft are present which are outside the scope of this website. 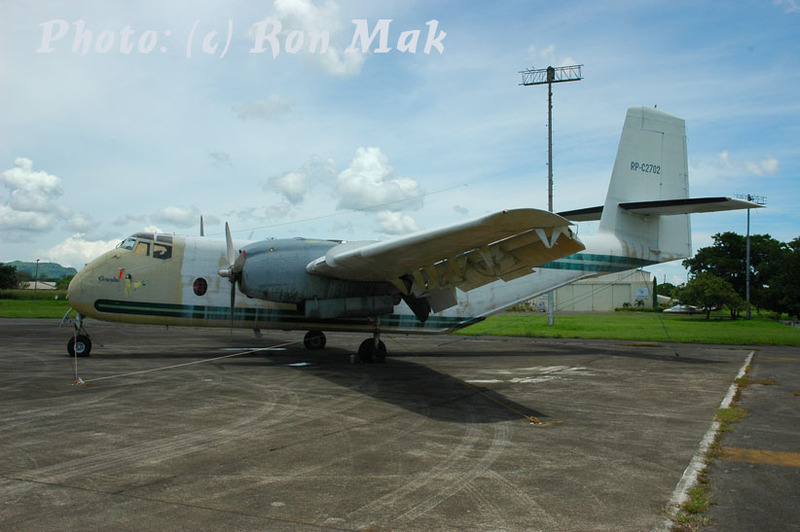 NAMC YS-11 RP-C3586 at Clark Jul07. 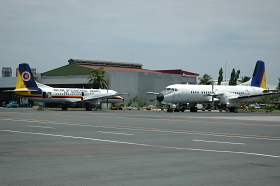 Ron wrote: "At Clark DMIA one can now find the Caribou, formerly parked at Omni Field; also this new NAMC YS-11 for Aboitiz and some smaller stuff in like the Beech and Dorniers." 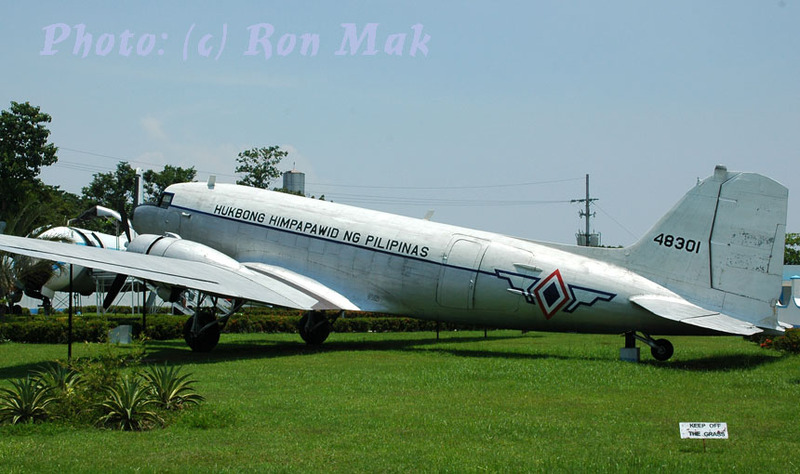 "I also saw some NAMC YS-11's at Manila-Domestic airport, most were without engines; the Connie and the DC-4 were still there, although moved to another location." 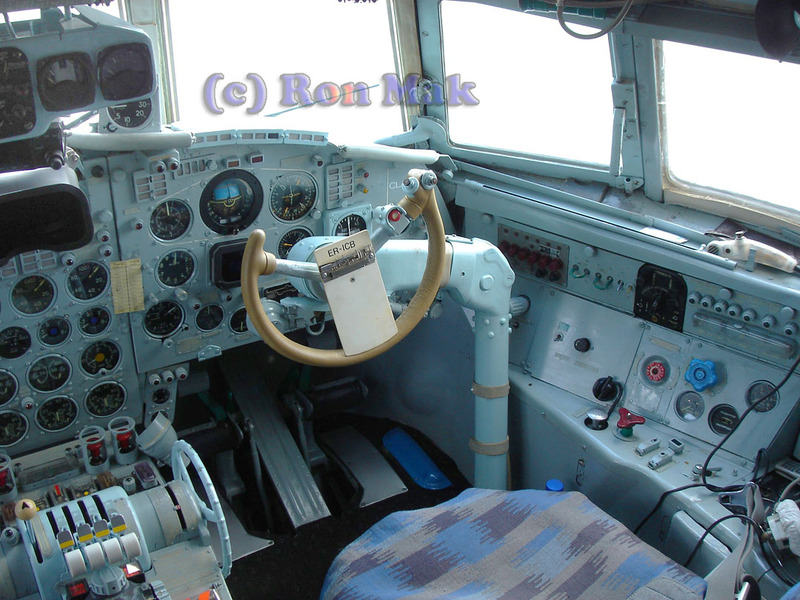 The history of this Beech E18S has been described on my webpage Photos by Friends & Guests page 6. In Propliner no.110 (2007) Peter J.Bish wrote a report on this aircraft, reporting "...on a recent visit (07Aug06) to this Beech E18S and owner Russell D.Large. 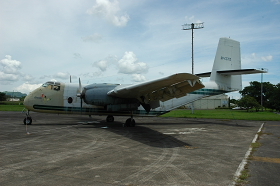 Russell bought the derelict 1957-vintage Beech in Yap (part of Federal States of Micronesia) in 2004 and ferried it to Clark for restoration. Despite initial intentions to remove the long nose modification, Russell decided that the long nose's purpose, the ability to carry 800lbs of baggae up front, made practical sense for his planned use around the Philippines. Although the original Beech 18 was certiffied for 8.000lbs, N5611D boasts a capability of 10.100lbs having also had a spar strap fitted during restoration. The only difference the long nose makes to handling the aircraft is extra sensitivity in pitch control. 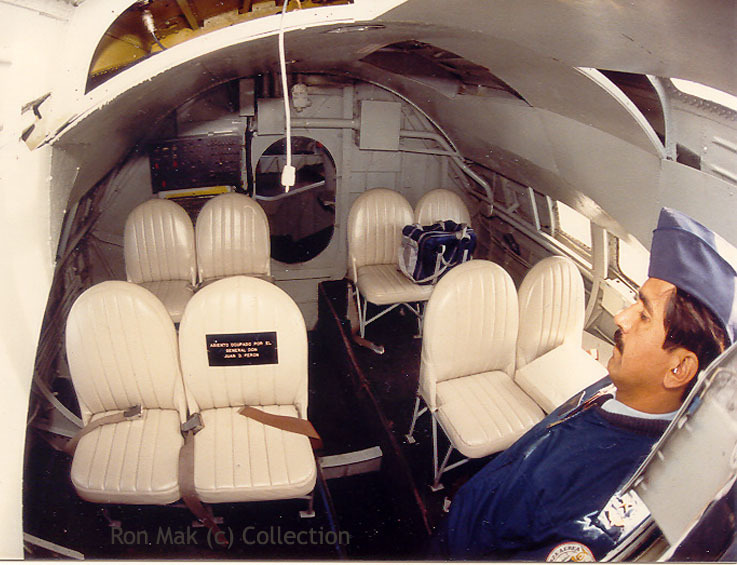 Russell is a former USAF C-123 and DHC-4 pilot and flew regularly in the early-1970s from Clark, where he since made his home and fine quality furniture business. 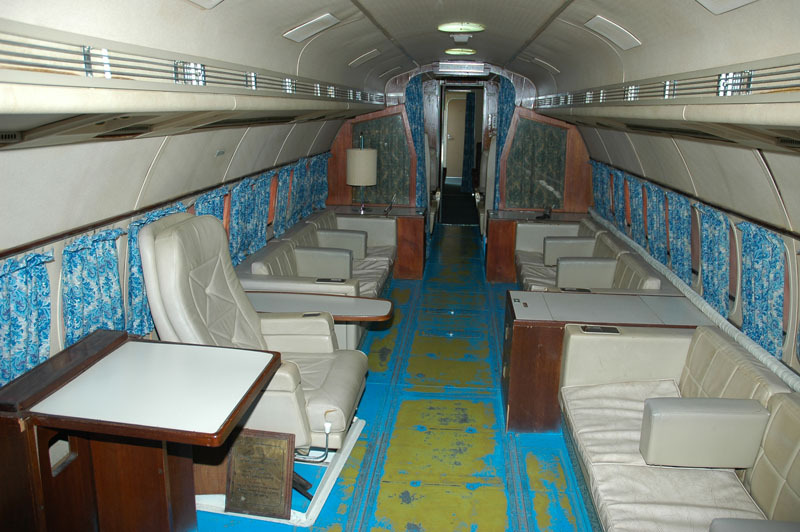 He upholstered the interior of N5611D himself, incorporating renovated seats from a Queen Air, totally new interior trim and headlining plus his own impressive instrument panel (including GPS panel). 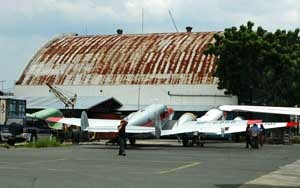 Russell keeps his Beech (and other aeroplanes) at Iren Dornier's Seaair facility on the northwest side of Clark." 'eLaReF'- Spar Strap: strengthening piece added to the spar to give extra life/weight lifting capabilities. Has to be 'approved' design, not just any old bit of angle iron riveted on! This concept is not confined to the Beech 18. 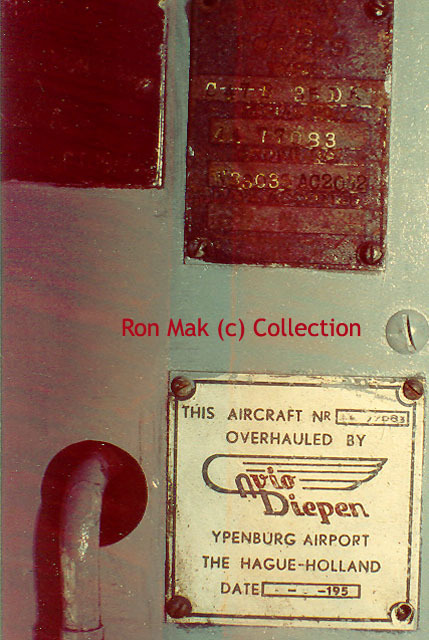 'Tripod'- In C-118's there would be a flat rectangular plate about 1""thick the width of the spar and would run about 12-14' across the spar,mid wing. A good airframe life extender. 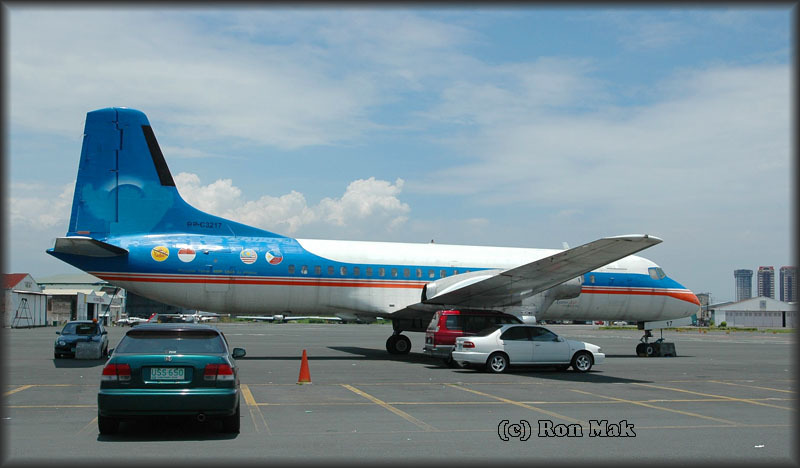 Heinz Rentmeister- when I checked the plane's plates at Clark Field, Pampanga, in 2005, it sported an additional modification plate: "E18S modernized to gross weight of 9600 lbs. per Beech drawing 404-000020, date 5/63." "my company is O'Driscoll Aviation and I noticed you have photos of my Caribou from the time when it was parked at Clarke awaiting repairs. I rescued this aircraft from demise and with a year and a half of effort, I turned out a good aircraft; the only thing I didnt complete was the paint. It had been rubbed back, but not painted. And I also renamed the aircraft to "Hannah", after my daughter, but I don't know if new owner will keep this. 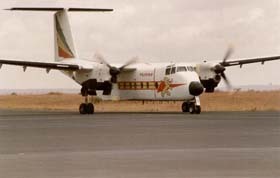 RP-C2702 had a reserved Australian mark of VH-ODI, but it didn't get that far. It was purchased for use in Australia, but I had a fire in the wheels just after purchasing it, while getting one of my pilots endorsed and before getting it home; so it took a year and a lot of maintenance. 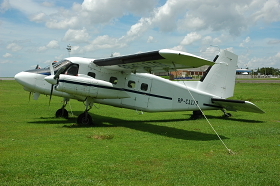 I have only just sold it to work in Africa; a South African company purchased the aircraft. I believe they already have Caribous. As I am overseas at the moment, I don't have his name for you." My page PHOTOS BY FRIENDS & GUEST -PAGE 19- has a March 2002 image, while RP-C2702 was being worked on. 1. 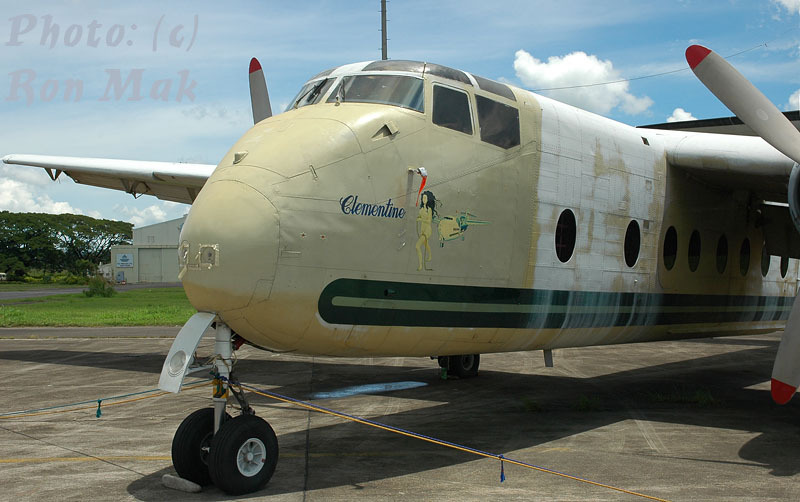 According to 'CASA' (Australian Register), there is no O'Driscoll Aviation in Australia, neither is there any aircraft registered under the name of O'Driscoll. 2. There are, according to my knowledge, no DHC4 operators in South Africa, unless you count Mozambique's. 3. 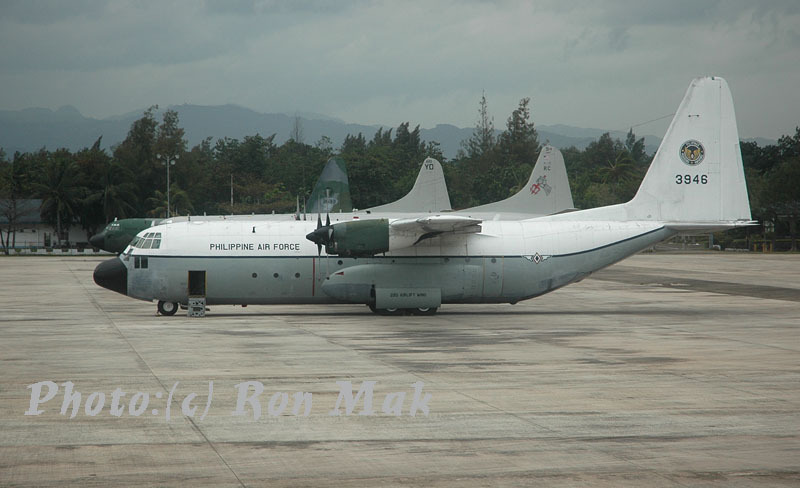 RP-C2702 is still in Manila, as of today. 4. I don't know how fast they reapply registrations in Australia, but until DEC05 VH-ODI was a Bell 206. If you sell an item such as an aircraft, wouldn't you remember the buyer company's name ? I am not claiming that Mr. O'Driscoll's statements are untrue, but there are just some inconsistencies. " I was the legal owner of DHC 4A RPC 2702, renamed "Hannah"; I have all the relevant docs if needed to prove the facts with me here, in Darwin. O'Driscoll Aviation is my company name, any aircaft I run are registered on my name. 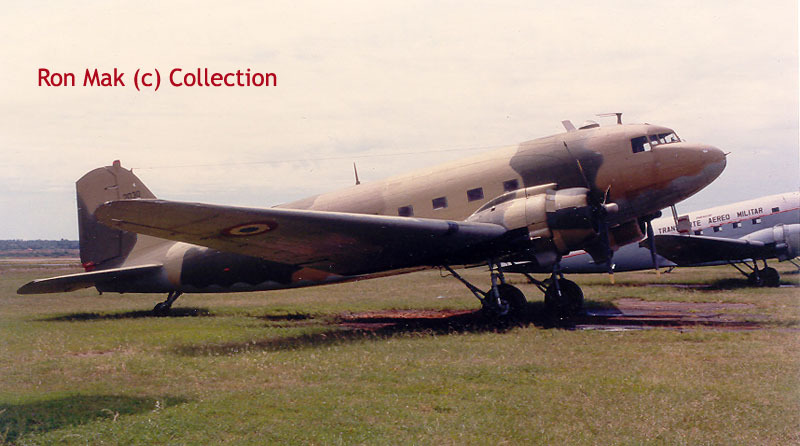 It had a RESERVED mark of VH-ODI, it NEVER made it to Australia. The only error I made is that at the moment the aircraft is still in Manilla, but it is going to Djibouti -not South Africa. 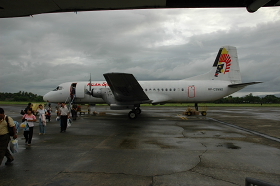 Manilla 02Aug07, RP-C550 of Victoria Air. 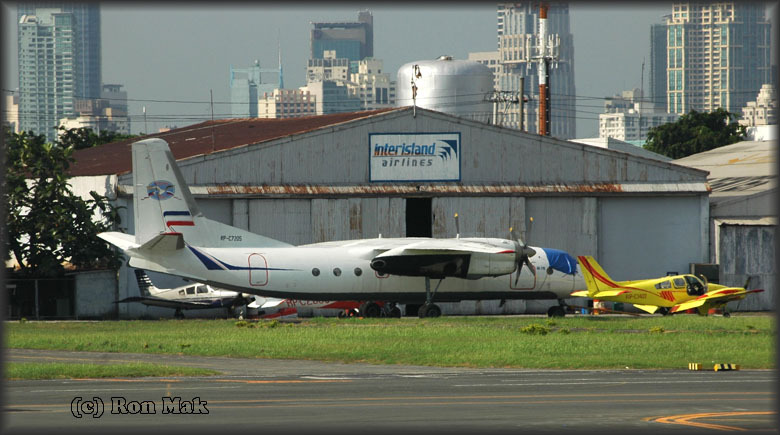 On 17Oct09 RP-C550 crashed shortly after take off from Manilla IAP, and reporting engine trouble; see report on Aviation Safety Network. "At last a Dakota which is operational again, RP-C1353; in 2004 it was hardly more than a wreck and it is now active again for CM Aero Services (unfortunately I did not get to see it fly). 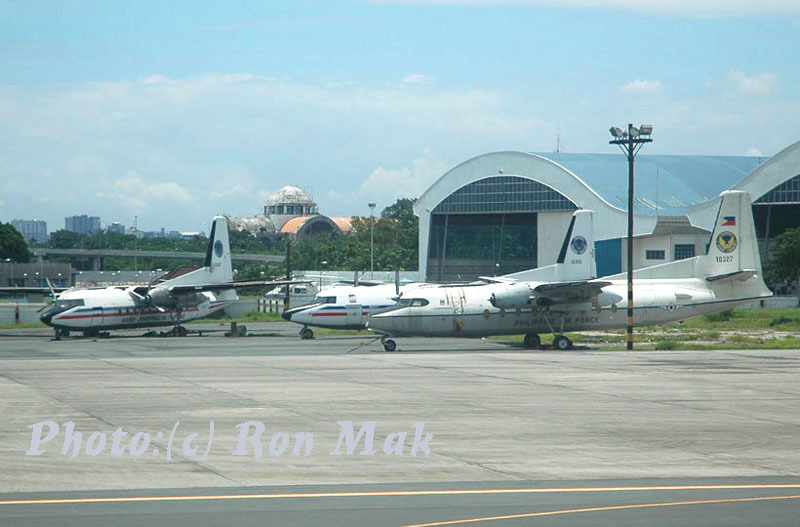 Photo taken at Manilla-Domestic airport. " 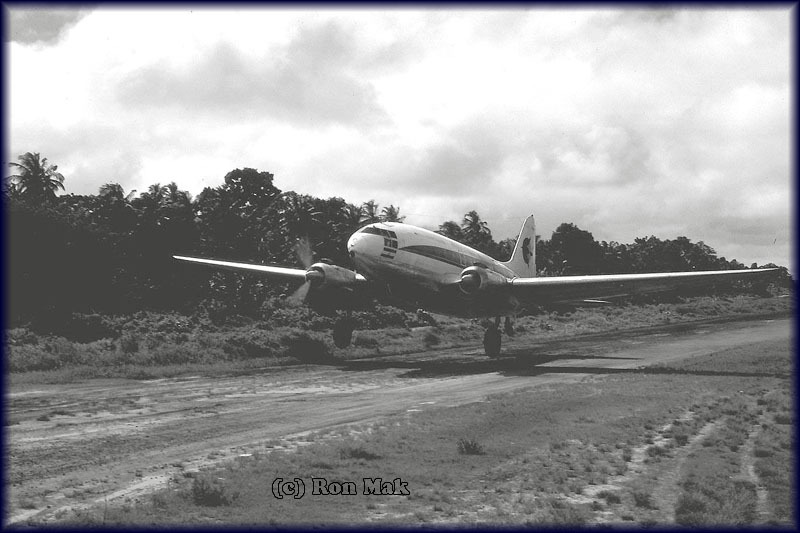 According to Aad van der Voet, longtime propliner historian and webmaster of www.OldWings.nl, there is a long-standing misidentification repeated in various reference book: "Contrary to what is often published in various books and magazines (including the well-known DC-3 book by Air-Britain), RP-C1353 is c/n 25571, and RP-C1354 is c/n 25368. Not the other way around!!!" RP-C550 cn25737, white green c/s, active (this one crashed recently, but think pics have shown blue cheatline). RP-C535 cn27016, silver c/s with light blue tail. 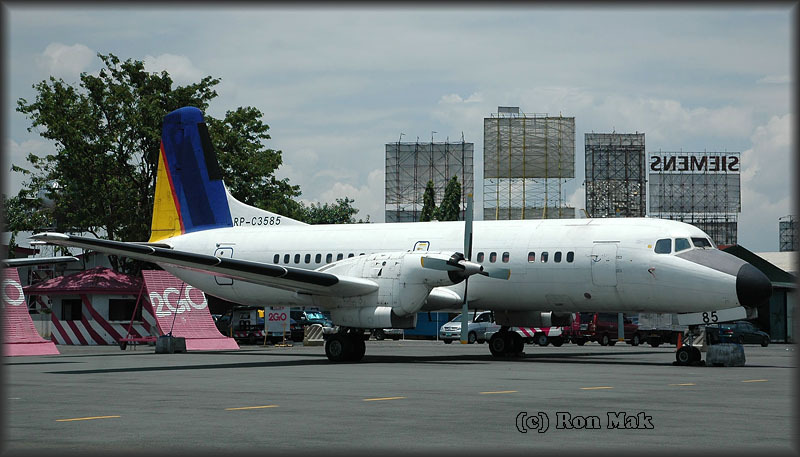 Paul Filmer wrote me: "Swiftair DC-3s RP-C147 and RP-C368 were still stored at Manila, both still present in Feb 2010 and December 2010 when I visited." 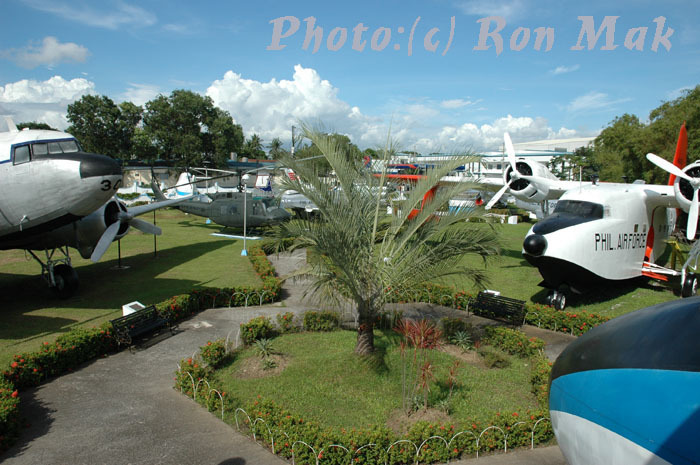 An impression of the museum at Villamor AFB, photos date from 2006 and 2007. Villamore A.F.B Museum, Manila -06Aug06-. 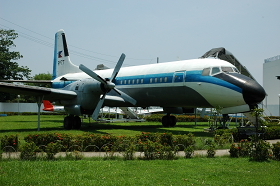 In the late 1950s, Japan's Ministry of International Trade and Industry conceived the plan for the 60-seat turboprop as a way for its aerospace companies to get into the aircraft production business. That led to the formation of the NAMC, a consortium comprising Mitsubishi Heavy Industries, Kawasaki Heavy Industries, Fuji Heavy Industries, Shin Maywa, Showa Aircraft and NIPPI. 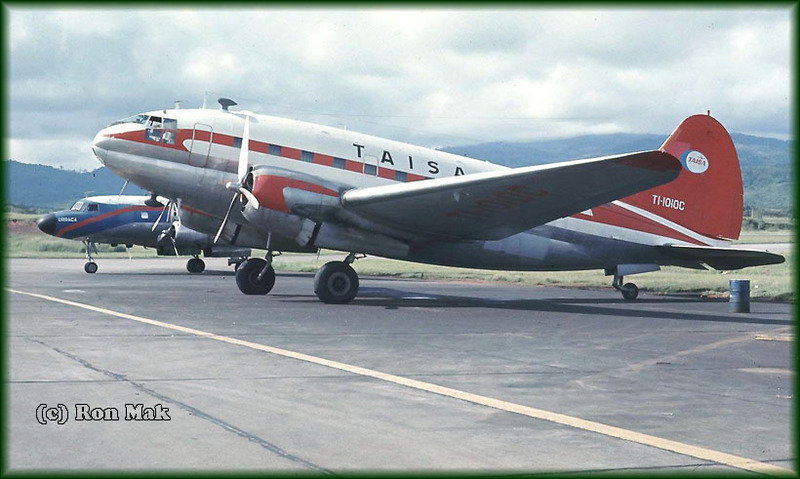 Mitsubishi was responsible for the final assembly and the forward fuselage, Fuji produced the tail unit, Kawasaki the wings and engine nacelles, NIPPI the ailerons and flaps, Shin Maywa the rear fuselage and Showa the light alloy honeycomb structural components. The Rolls-Royce Dart engine powered the YS-11. 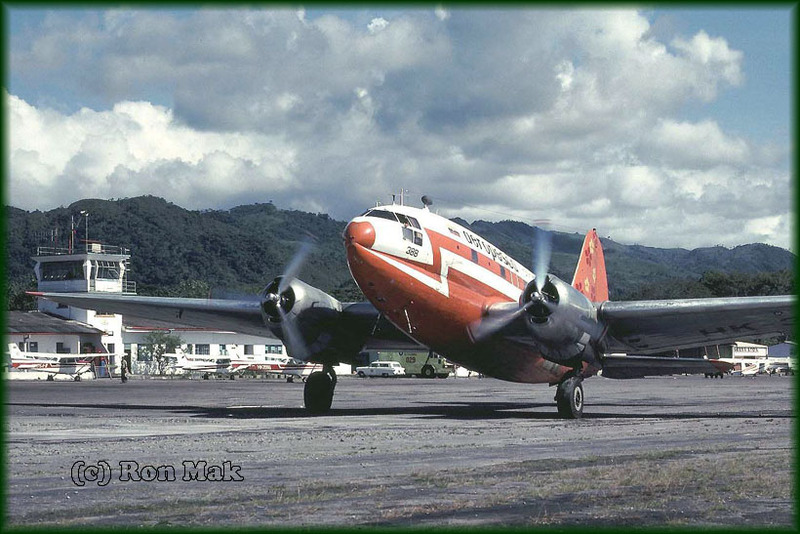 NAMC began the design stage in 1959 and the firstYS-11 flew in August 1962. 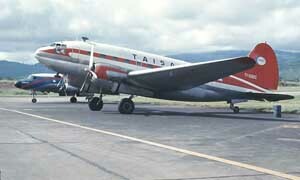 The type received Japanese certification 2 years later and entered service with Toa Airways in Apr65. By the time the production line closed in 1974, 182 YS-11s had been manufactured, including 23 for the Japanese military. 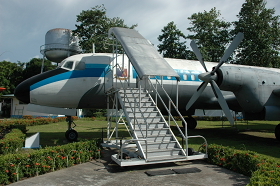 In performance terms, the YS-11 did well against its 2 nearest rivals: the Fokker F.27 and Vickers Viscount. 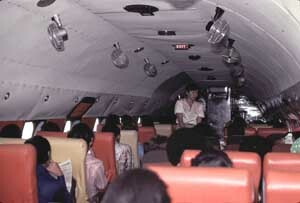 It could carry more passengers than the 40-seat F.27, which it replaced in Japan and many other markets, and was cheaper to fly than the four-engined Viscount. But the program is estimated to have lost ¥36 billion and was a financial flop. Lack of coördination within the consortium was a major problem; each company pushed its own agenda. 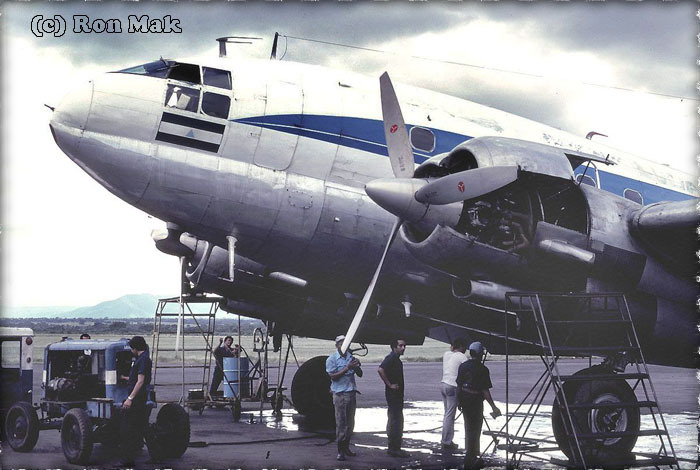 Contributing factor was Japan's inexperience in the passenger aircraft market, which meant that the YS-11 did not have a proper marketing and after-sales plan. before going to the Philippines. 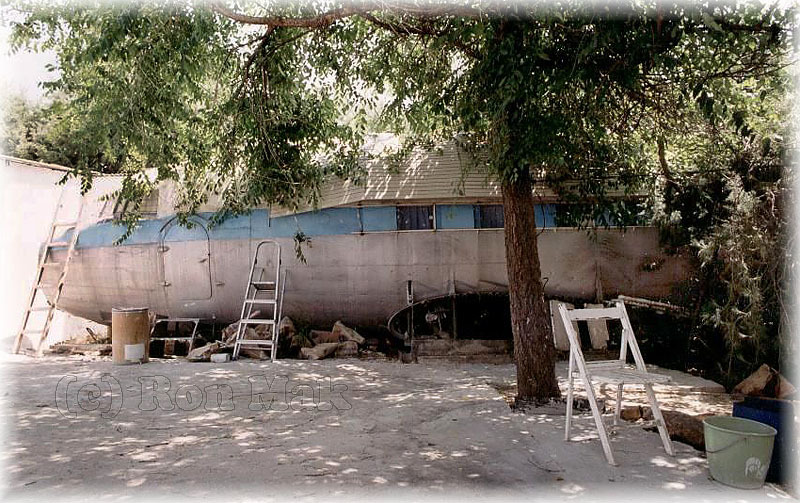 (06Aug06). 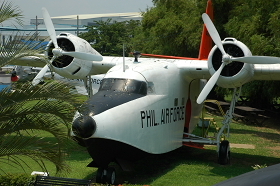 HU-16 48607 preserved Villamor AFB, Manilla (31Jul07). Disembarking at San Jose from NAMC YS-11 on 07Aug06. 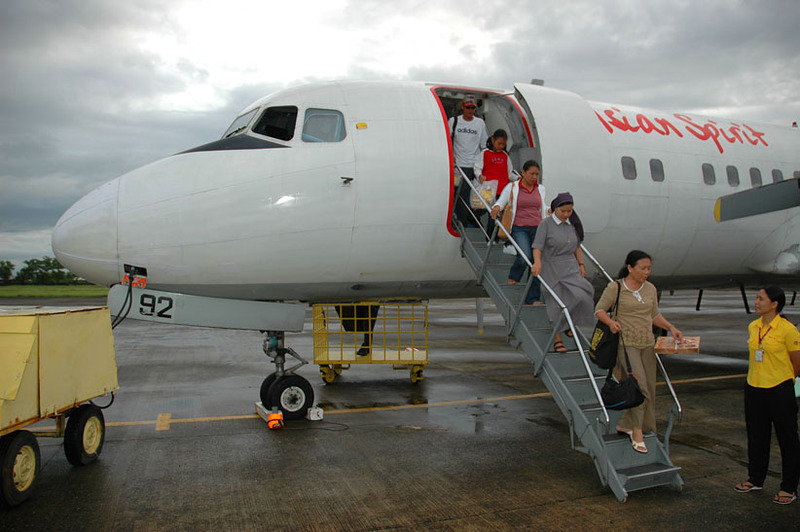 RP-C3592 sustained substantial damage on 02Jan08 when it overshot the runway on landing at Masbate Airport in windy conditions. 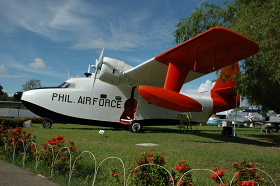 It originated from Manilla with 43 passengers onboard. The aircraft is understood to have touched down with one set of wheels off the edge of the runway. 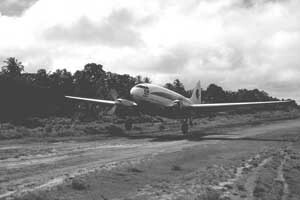 It overshot the runway and came to rest against a concrete perimeter fence, damaging its nose and the right propellor on impact. The right main landinggear collapsed and there was also fuel spillage. No injuries were reported. En route San Jose - Manilla, 08Aug06 in an YS-11. 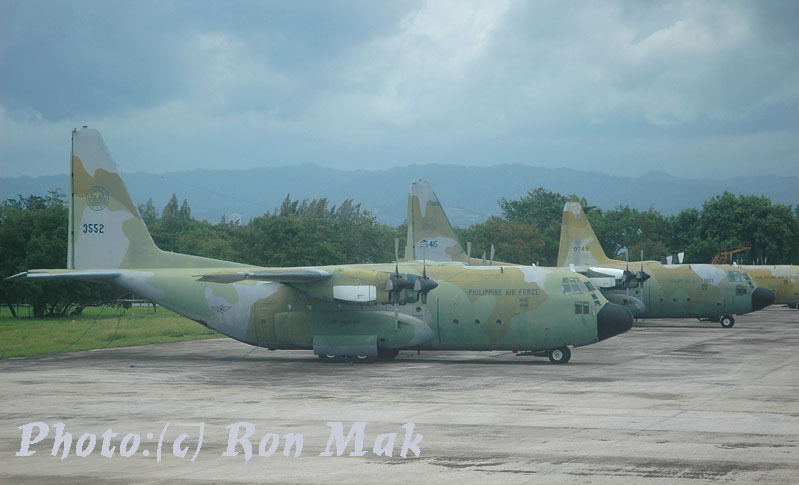 We conclude this 'report' with some photos of military prop transports. 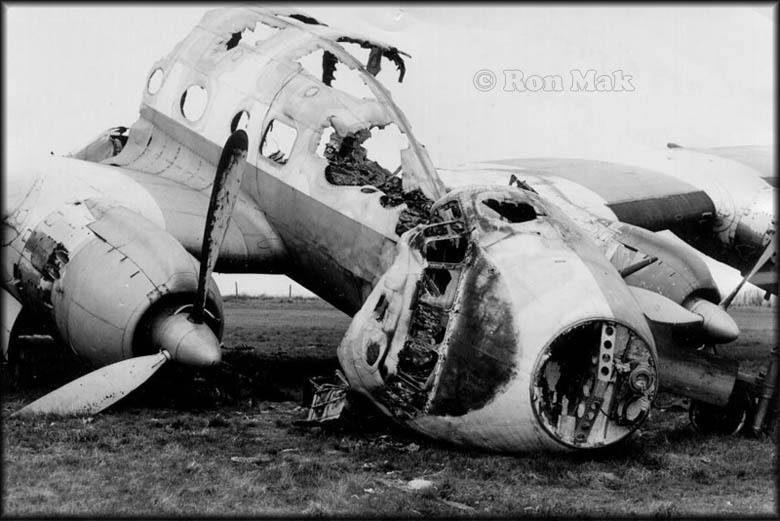 On the right we see 3 Fokker F.27s, from left to right can be read: 'unidentified' (reported as 10267)- 10310 - 10327. Paul Filmer wrote in Dec.2010: "10267 is correct - I have shot that one twice this year." 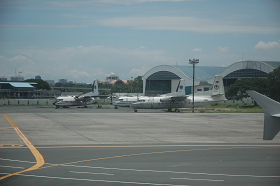 Philippine Air Force Hercs (left to right: 3552, 3545, 0749) at Mactan, Cebu (08Aug06). 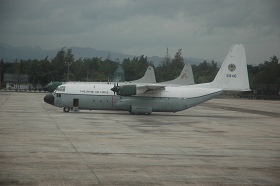 C-130 Hercules, 3946, at Mactan (Cebu) 08Aug06. "I arrived in the Philippines in 1995, looking for a job as a pilot; I didn't really find any since then, though I never stop trying up... 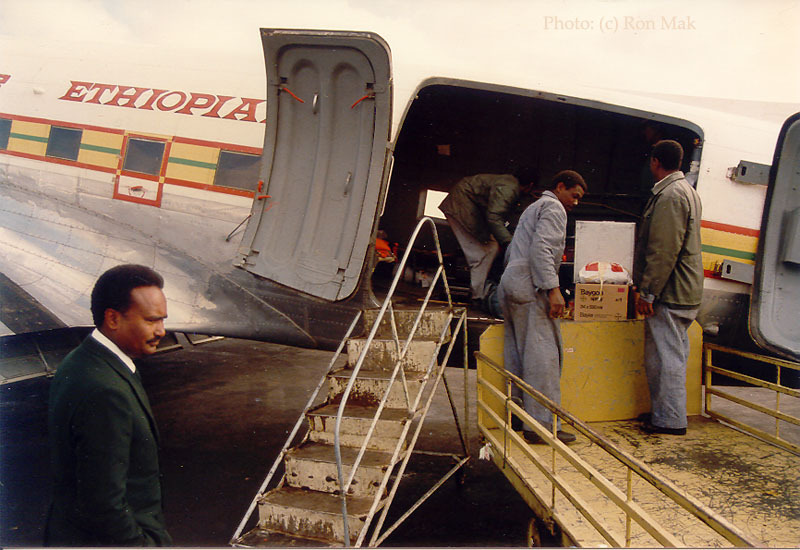 I had a contract with Swiftair, and flew their DC-3 RP-C147. At this time, Swiftair had 2 operational DC3s, plus a 3rd stored in Zamboanga and used, as I was explained, for spare parts - a peculiar idea, considering the distance between Manila and Zamboanga. 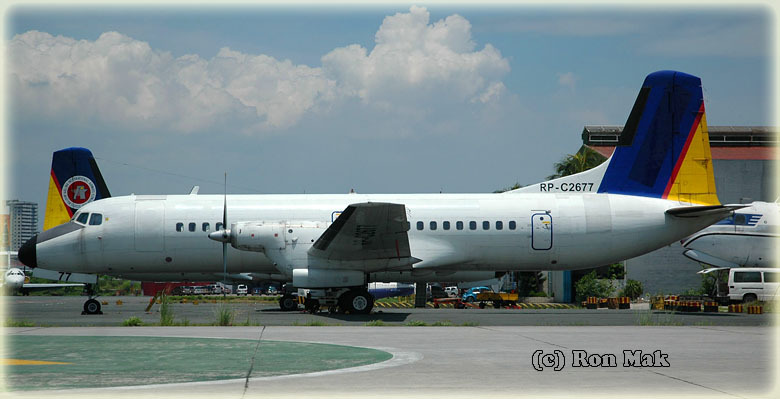 Though I couldn't say for sure what the registration was of the 2nd operational aircraft, I would bet that it was RP-C860, while RP-C862 was the plane stored in Zamboanga. 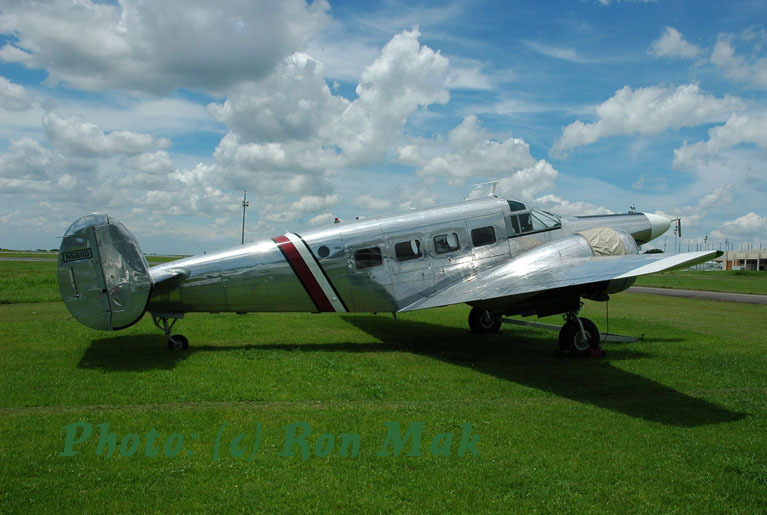 This 2nd aircraft wasn't a C-47, but an original DC-3, built in 1937. If the version of the then-Swiftair manager is to be believed, RP-C860 had been first sold new to a Japanese operator and, much later, purchased from Japan Air Lines. 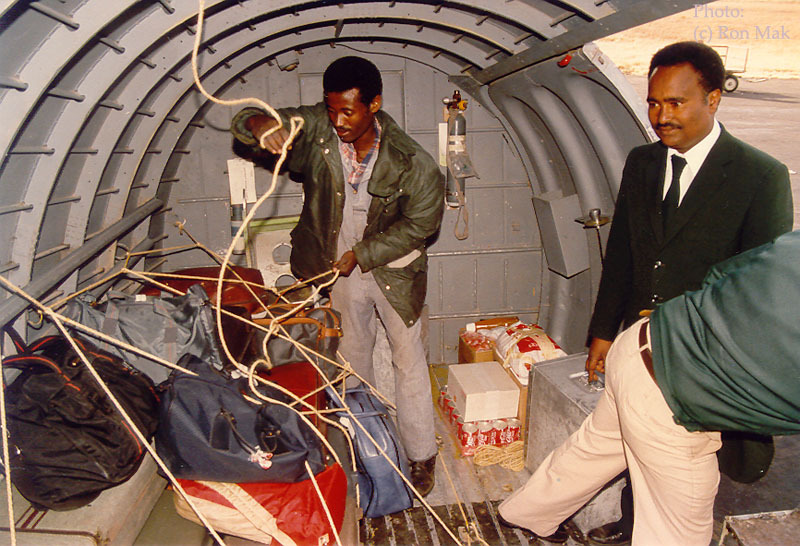 I unfortunately forgot what had been done regarding the obvious need of a cargo door, but RP-C860 still had its passenger door on its starboard side. Unfortunately, days after my first flight a typhoon severely damaged RP-C860 (or what I believe was RP-C860) while being parked at Manila airport. 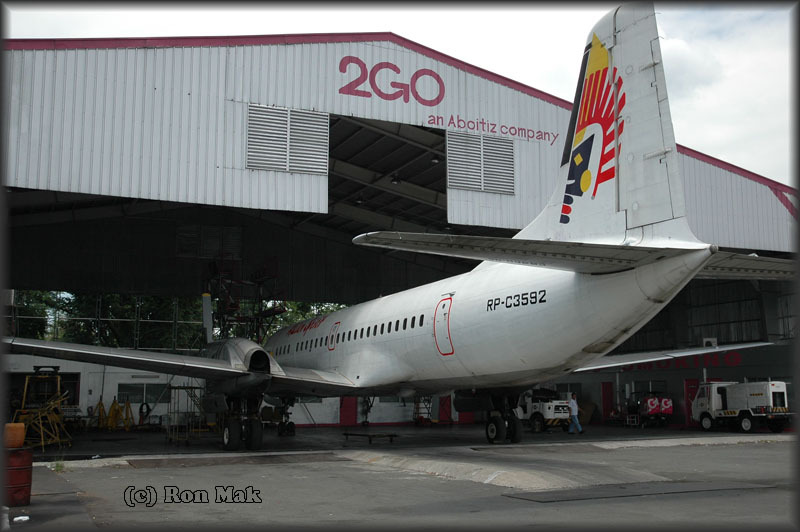 Swiftair planned to dismantle RP-C860 entirely, before sending her back into service. Perhaps the company was sincere, but seeing them struggling financially, I knew there were very few hopes this would ever happen. I don't know when Swiftair finally suspended its operations, but I'd guess this was sometime during 1997 or 1998. 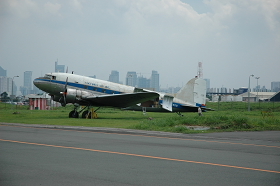 Stored in open air, one of their aircraft is still slowly rusting away in Manila. If this is RP-C147, this is a very sad thought, considering she was absolutely pristine when I flew her - Swiftair took great care of maintenance. 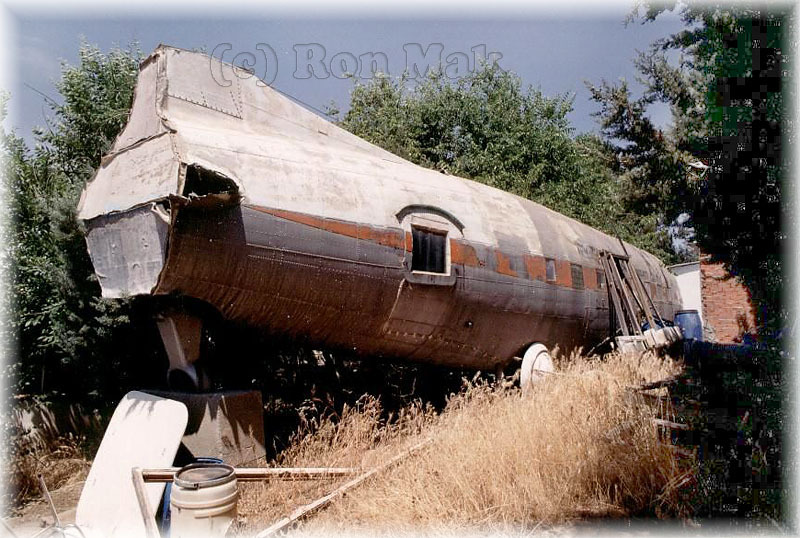 Perhaps this e-mail won't bring you any valuable information, but seeing your picture of a Swiftair DC3 brought me back of lot of memories which I really wanted to share. Thanks!" 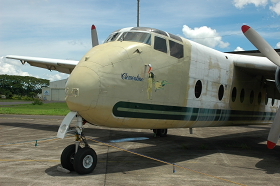 Antonov An-24V RP-C7205 (c/n 77303) at Manilla in August 2007. 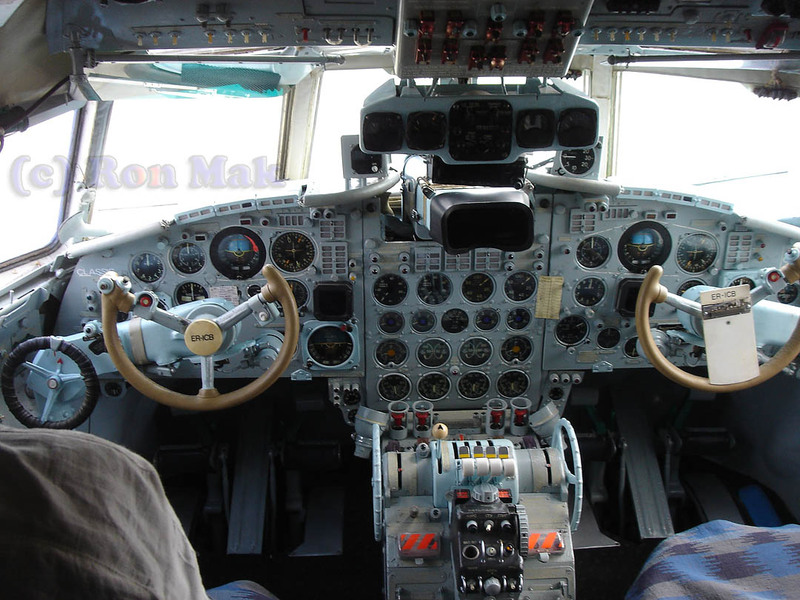 The operator is Mosphil Aero. 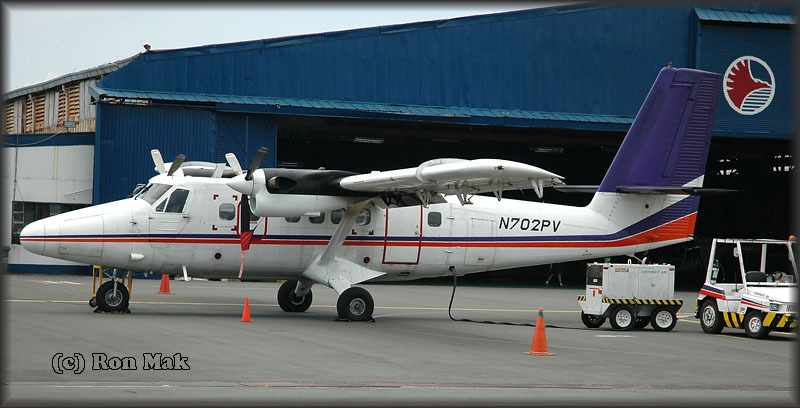 The last operator was Asian Spirit, though it has been leased/operated by South Phoenix Airways at some point. 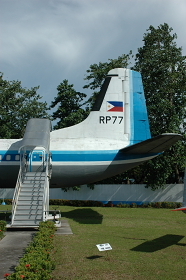 On the fuselage is written: "Philippine Partner BIMP - EAGA Air Alliance". Now stored, what will be next ? 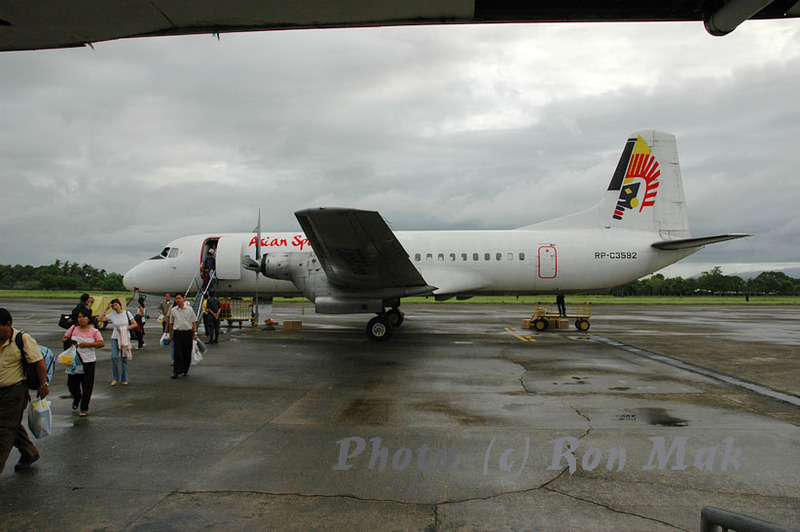 This NAMC YS-11A-500 is RP-C3592 of Asian Spirit, taken during the same visit to Manilla IAP. As JA8735 it enjoyed a career with Air Nippon. 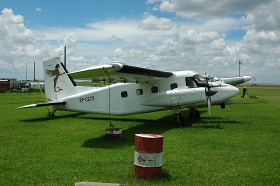 Asian Spirit bought RP-C3592 in 2003, when the YS-11 were phased out in Japan on a massive scale, many went to the Philippines. Sep.2008 issue of Aviation Letter carried the news that Asian Spirit had withdrawn the last YS-11 from its fleet. 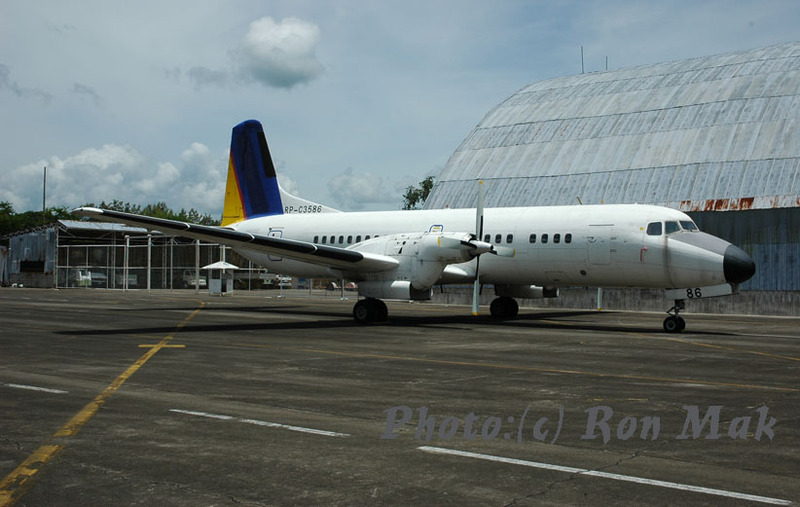 Formerly operated as JA8717 by Japan Air Commuter, it was damaged on 30Aug04 by a typhoon... but it was repaired and found its way to Aboitz Air and this NAMC YS-11A-500 is now registered RP-C2677. Its c/n is 2092. RP-C986 is a Beech G18S (cn BA-557) of which the owner is described as C.R.Miller and is operated by CM Aero Services. 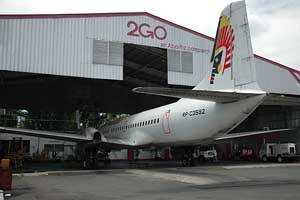 Previous identities include N9308Y, N607RP and N807P . 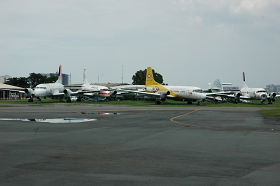 In the back is RP-C707, a Beech E18S (BA-126), also owned by C.R. 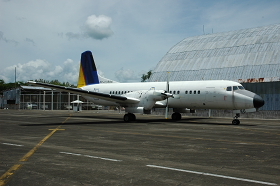 Miller by operated by Commuter Air Philippines. 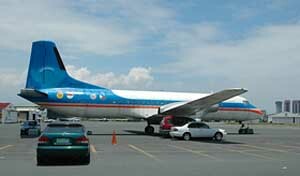 Previous identities include JA5502 and N8475D. 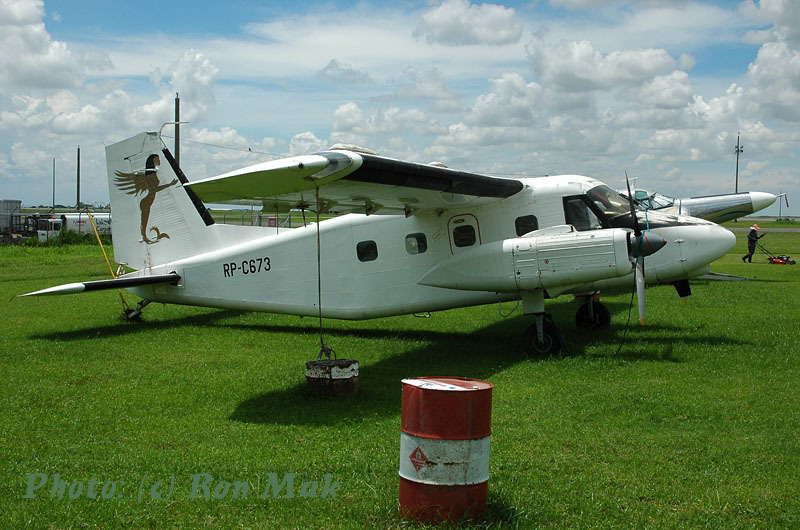 This De Havilland DHC-6-300 Twin Otter N702PV (c/n 702) was registered to Baymen Int'l Ltd on 23Jan07 and Ron came across this impressive "Truck of the Bush" at Manilla on 02Aug07. 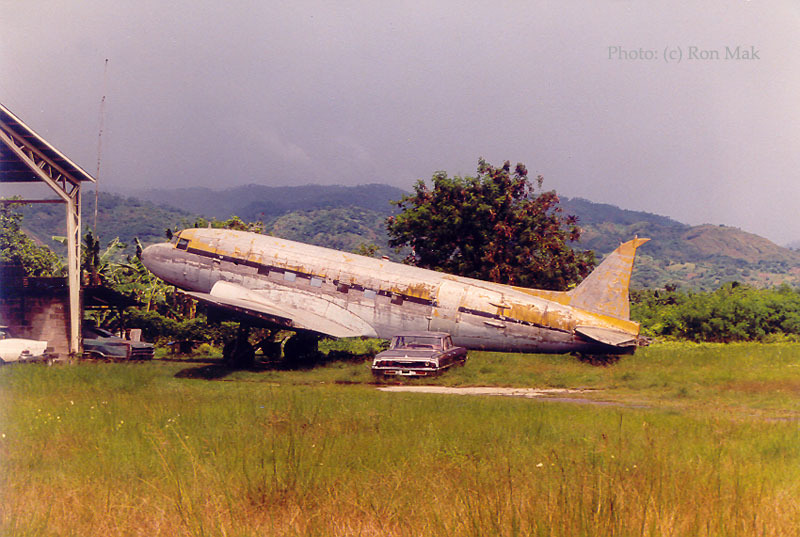 This fine shot depicts Curtiss C-46A Commando HK-388 of Aeropesca; the location was Villavicencio,Colombia in 1980. 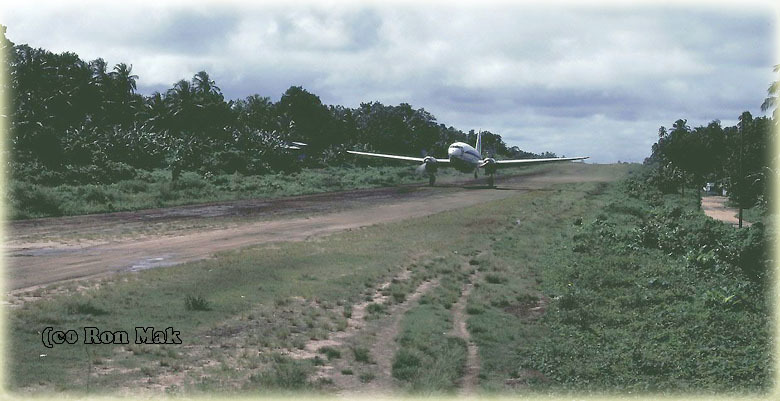 This is YN-BRG, coming in to land at a dirt strip at Corn Island (date Nov.1980). One may not be too surprised to learn that YN-BTG c/n 22576, in service with Aeronica, has vanished too: ulitmate fate unknown! 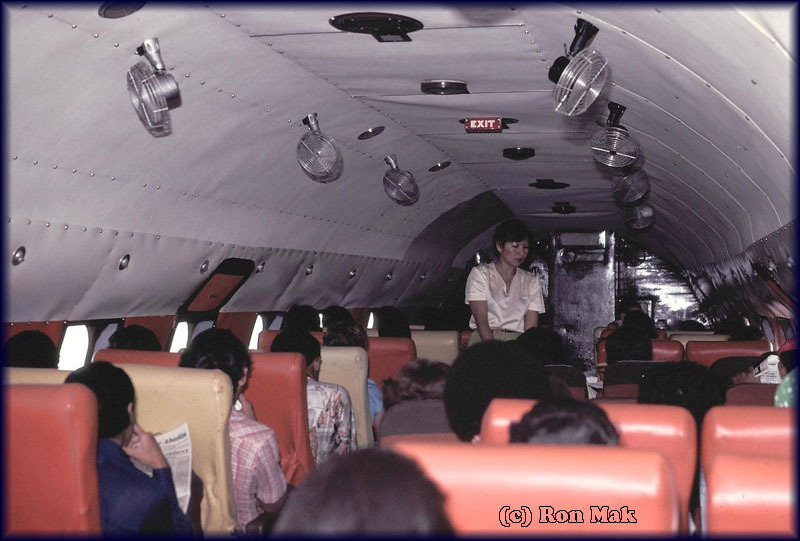 In flight service between Corn Island and Bluefields Nov.1980 ! 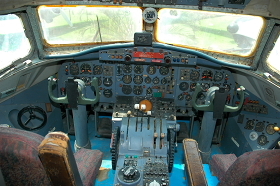 Cockpit of YN-BRG. 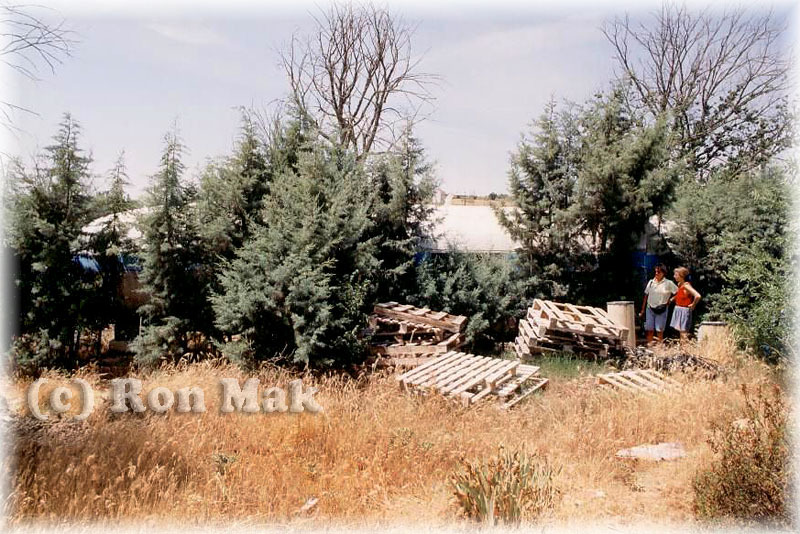 Photo taken 07Nov80. 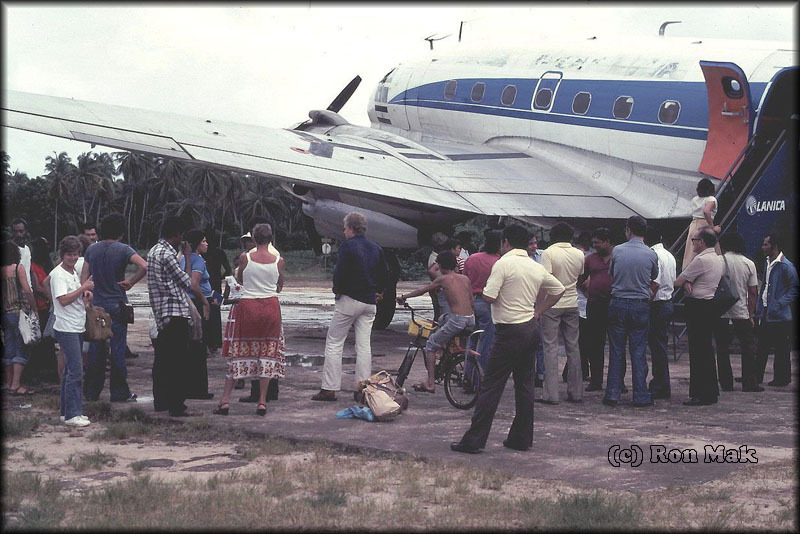 Bluefields 06Nov1980: The Bluefields air terminal is located on Nicaragua's Atlantic Coast in the South Atlantic Autonomous Region (RAAS), approximately 45 minutes from Managua by plane. Its coordinates are: N 11 59' 20", W 083 46' 30". 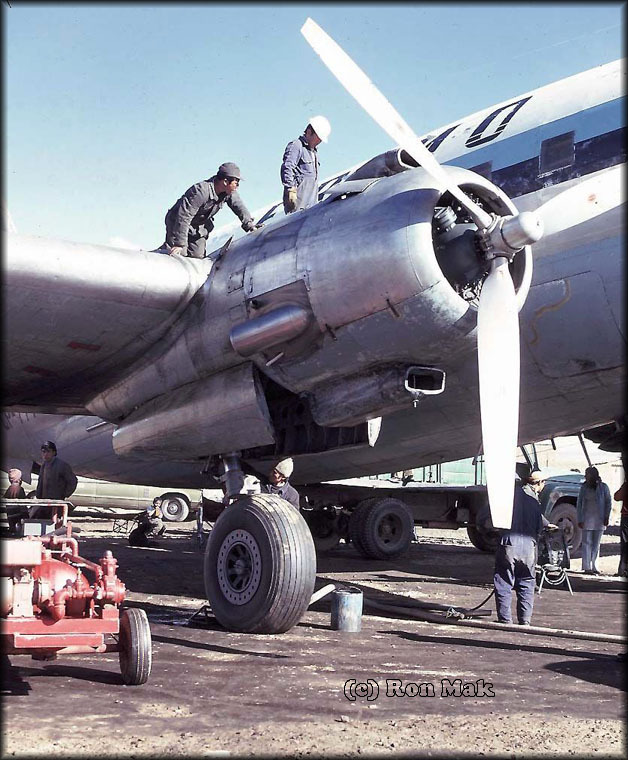 Curtiss C-46 under maintenance on the ramp at La Paz, Bolivia. 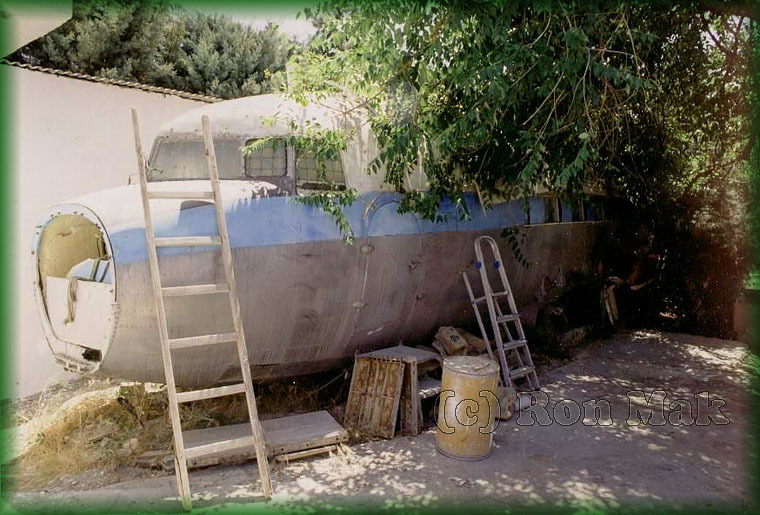 Ron came across these two DC-3's at Villanueva del Pardillo -near Madrid,Spain- in 1991. 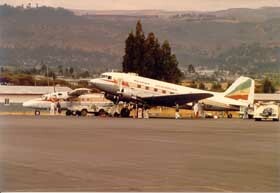 According to the owner it concerned two former Iberia DC-3's. Comments on the identity welcomed !! 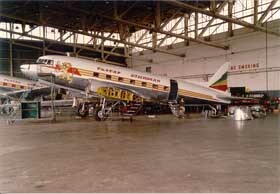 In december 1991 I have visited both Dakota's (there is NO C-54). 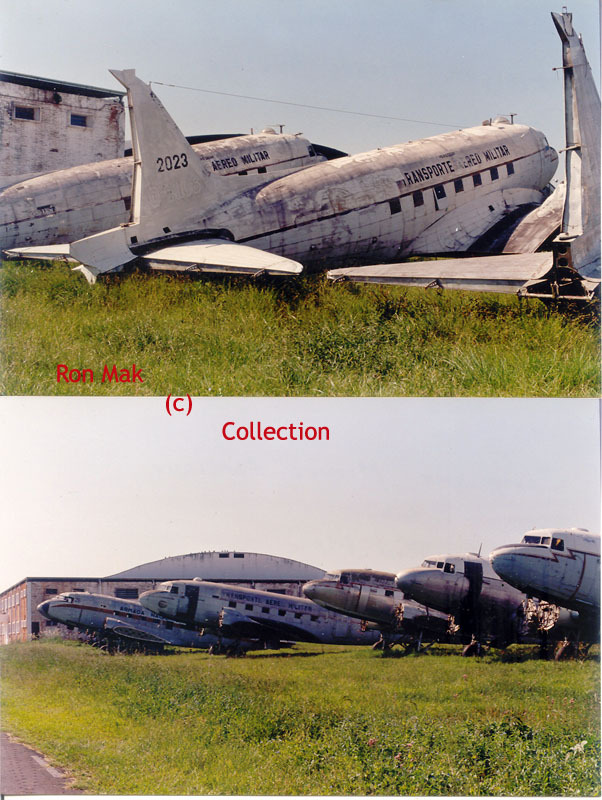 These are former Iberia DC-3's and only the fuselages were present. 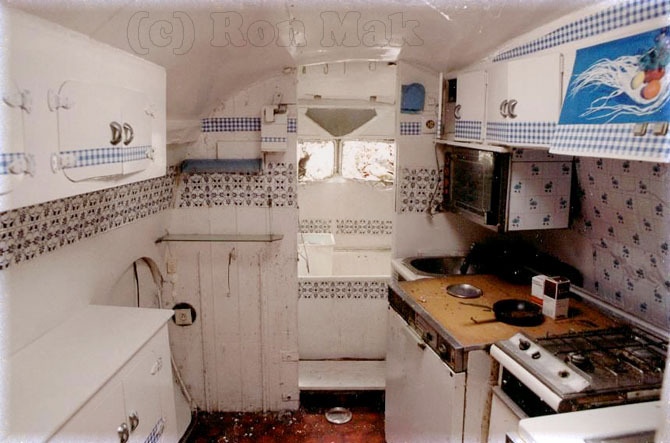 It was also possible to have a look inside, but it was not possible to find any ID's. 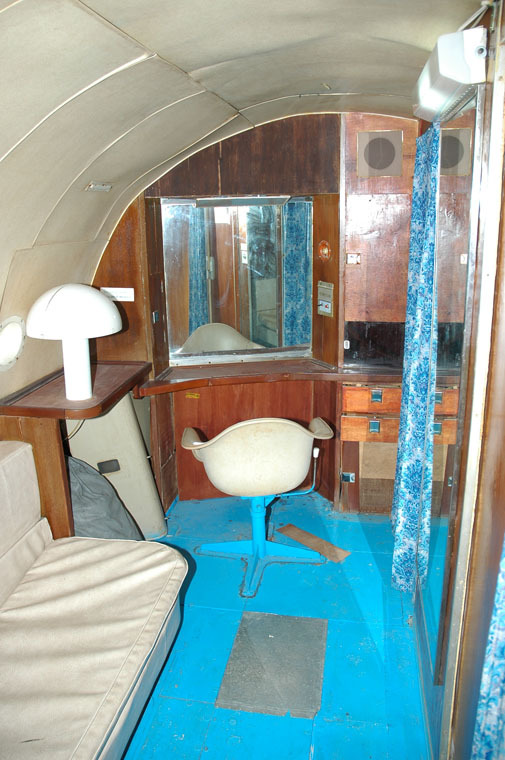 There was a bathtub inside the cockpit !!! The location is between Villaneuva del Pardillo and Villafranca del Castillo (closer to the latter) along road M509. About 25km NorthWest of Madrid. If you ask in the village, people can help you. 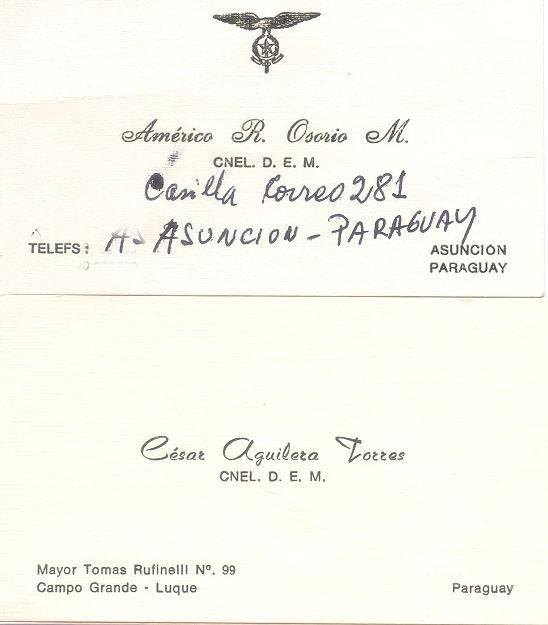 I have a note saying they could be EC-ACL (c/n 12154 ?) and EC-ACK (c/n 20405 ?) but no confirmation. 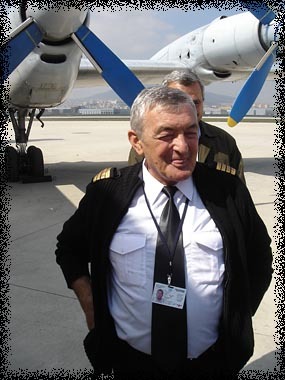 Ron photographed this Ilyushin IL-18D ER-ICB (c/n 188010603) at Istanbal-SAW on 23Mar06. 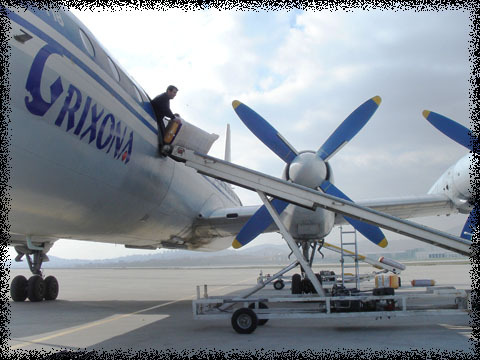 As ER-ICB it has operated for Pecotox Air, Grixona, Galaxy Air (leased) and is currently (April 2008) operating for Tandem-Aero. Before becoming ER-ICB it was RA-74296 and operated for Tretyakova Airlines and before that: Aeroflot. 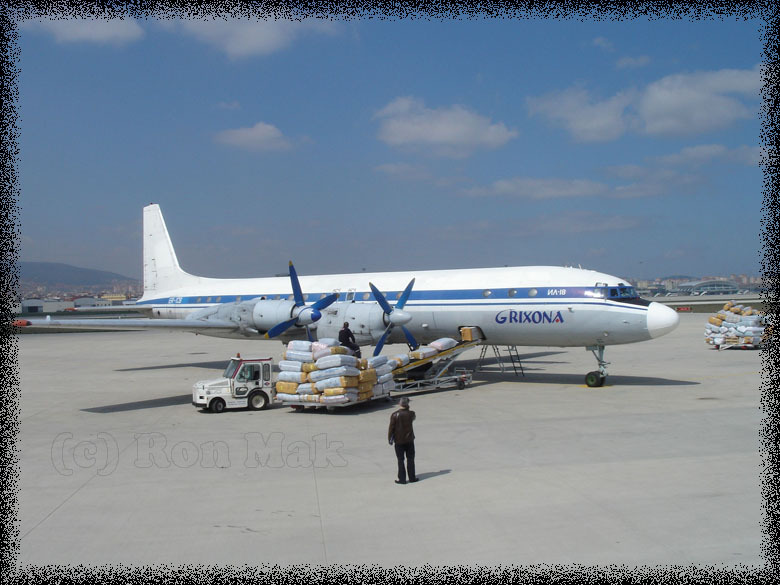 This IL-18 arrived unexpectedly at Istanbul-Sabiha Gokcen, from Pristina ( Kosovo ), and was seen loading textile. At night it continued on to Baku for a fuelstop and onwards to final destination Biskek. 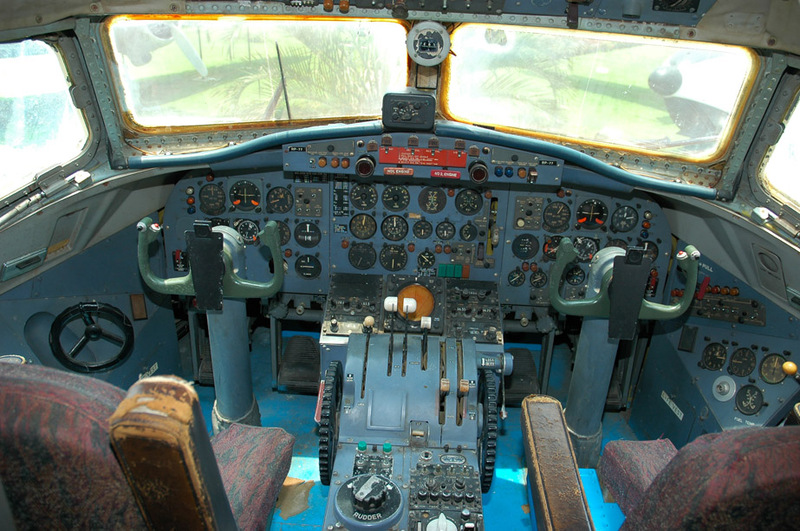 The cockpit made an excellent impression: Capt Russo Vladimir himself had recently painted it and restored it to 'as new' condition! 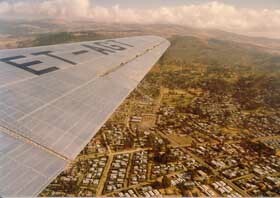 Capt Russo had also flown in Angola for a company called Alada. A photo on Airliners.net has this to say about DC-6A ET-AGY (c/n 45500): "Ethiopian AL had this one remaining DC-6B in 1981. 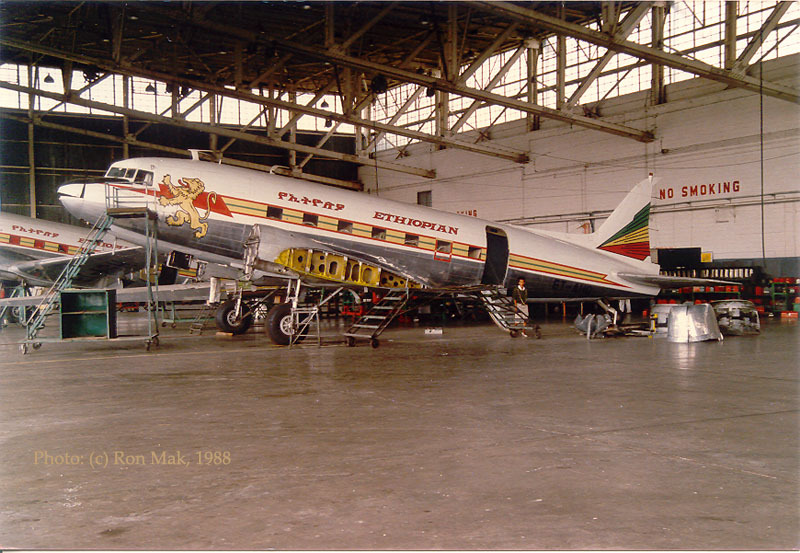 This craft was originally delivered to Canadian Pacific in 1958 and also served with Trans Caribbean and was built much earlier than those built for Ethiopian. This DC-6 joined the airline in 1978. The original three DC-6Bs (ET AAX, Y and Z) delivered new to Ethiopian in 1958 had extremely interesting histories, including the opening of the first coast to coast route between East and West Africa." 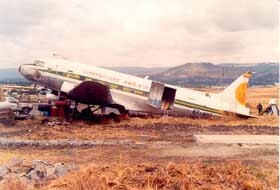 In the background are the forward fuselage remains visible of another DC-6, ET-AER. More on this HERE..
And more photos taken at Addis Ababa can also be found on Ron Mak's page 3.. 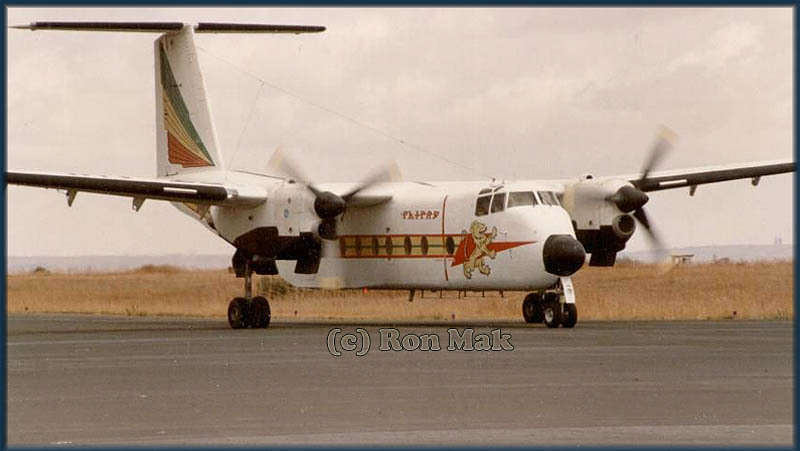 This deHavilland DHC-5 Buffalo is seen taxiing in..
My JP Airline Fleets 1988 edition states Ethiopian operated 2 Buffalo's: ET-AHI (c/n 101) and ET-AHJ (c/n 102). 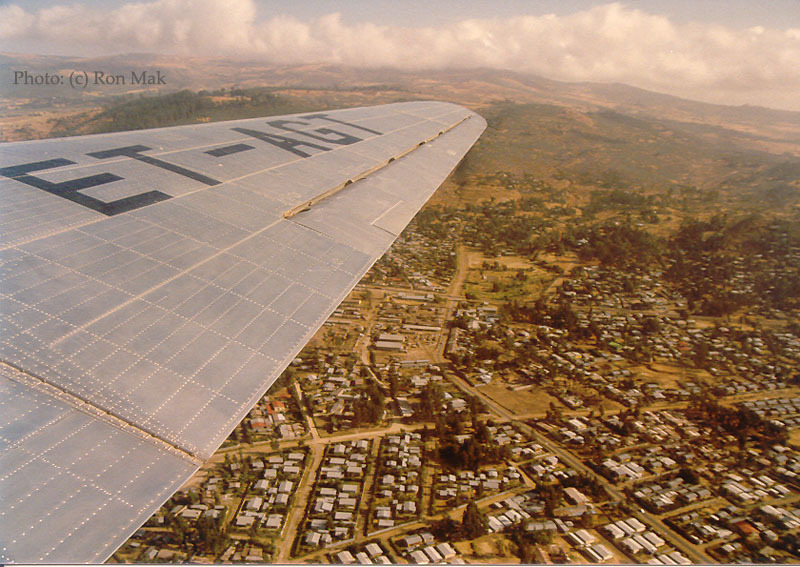 Addis Ababa (wikipedia) anno January 1988..
Ron sent this image in Oct.2008 and added: "DC-3 of Ethiopian AL near their headquarters at Bole Int'l Airport, Addis Ababa, taken during my last visit in in April 2005". 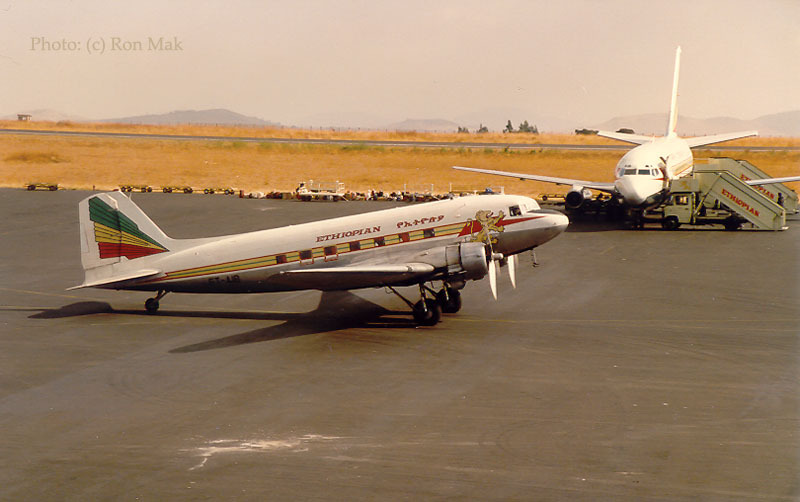 Douglas DC-3 'ET-T-1' (c/n 9628) was the first DC-3 owned by Ethiopian Airlines; the tailnumber 'ET-T-1' was issued in commemoration of the Golden Jubilee of Ethiopian AL on 20Apr96. 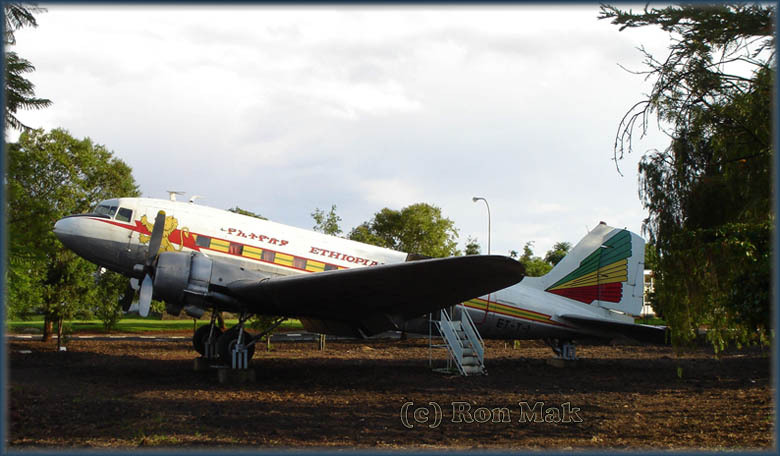 Roy Blewitt added (Feb.2013) to this: "DC3 'ET-T-1' is actually (or was) ET-AIA, painted to represent the first aircraft Ethiopian Airlines operated. 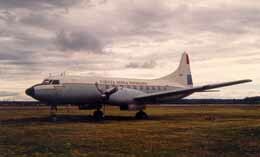 I don't have my reference books available to me right now, so I don't have details to hand on what became of the real ET-T-1..."
Douglas DC 6 c/n 43124 was delivered to SAS as SE-BDF in June 1948 and named "Alvar Viking". 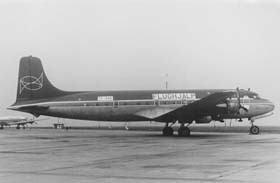 After a 6 month lease to Olympic Airways 1959 it was bought by Transair in January 1960 and was named "Knut Folke". 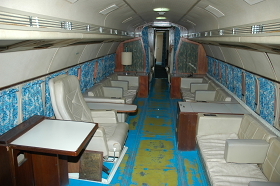 The aircraft was also leased to the United Nations between October 1961 and June 1963. After service by Transair, with the new name "Helsingborg", the aircraft was flown by Transavia Holland from July 1966 until April 1968 as PH-TRA. After that the aircraft took part in relief flights to war torn Biafra; at first it was leased by Nordchurchaid, then bought by Flughjalp and registered as TF-AAD. At some later date it was declared w.f.u and stored at Prestwick, Scotland. It was finally broken up in 1984. G-ANTF, Lockheed L.749 (c/n 2504) taken on 06Apr1971 at Coventry-Baginton. 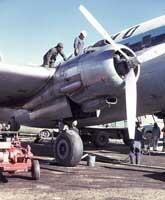 Its career saw service with TWA, Air India, Qantas, BOAC, Transocean, Capital Airways and Ace Freighters. G-ANTF was cancelled from U.K register on 04Dec67 as sold to USA, but never delivered. 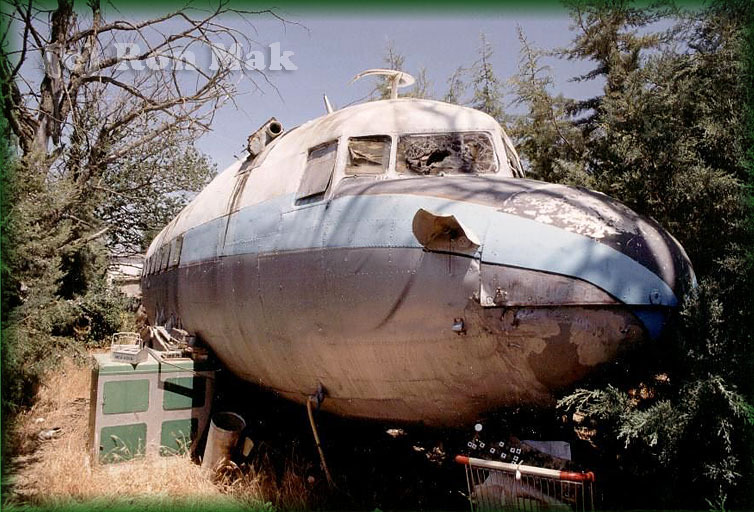 Its condition gradually deteriorated, then sadly set on fire 01Feb70, destroying most of the fuselage. The remains were scrapped during late 1971.